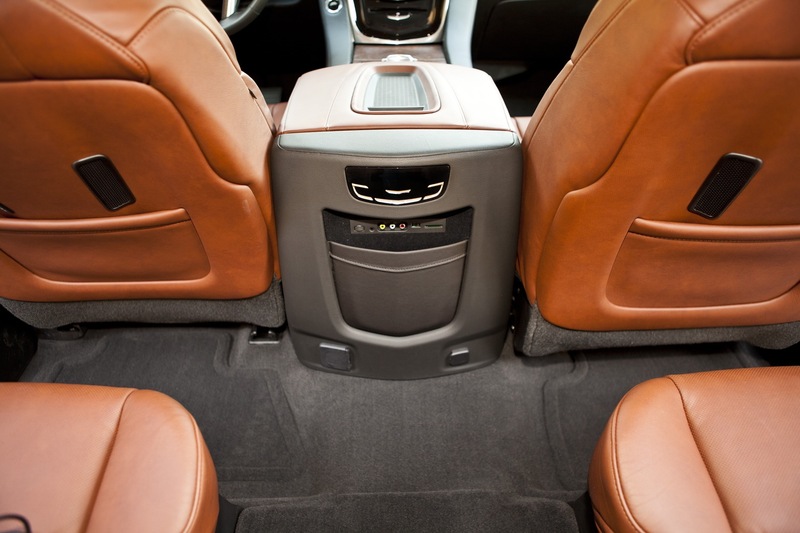 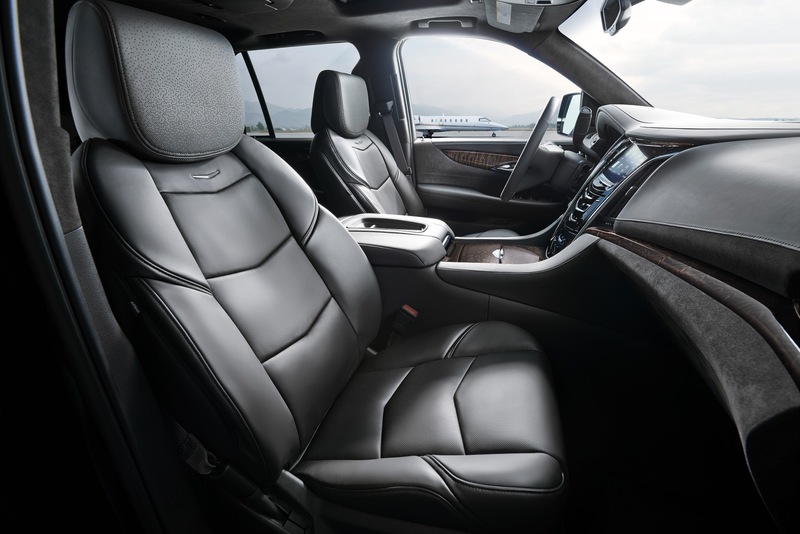 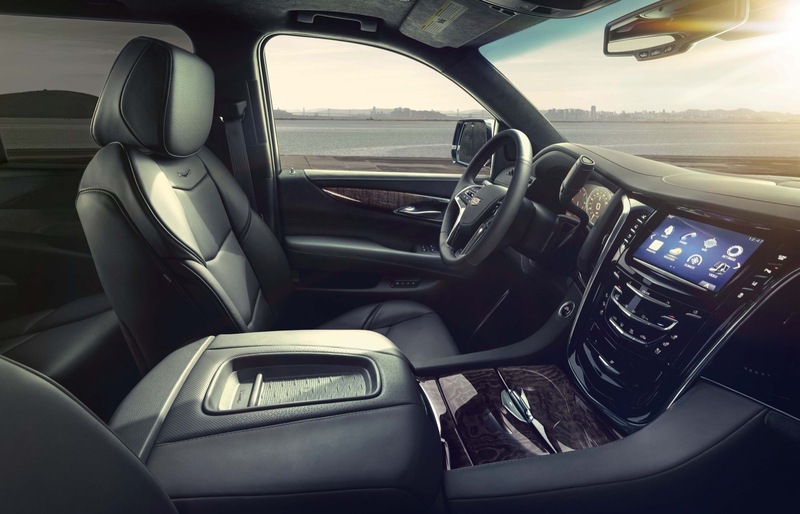 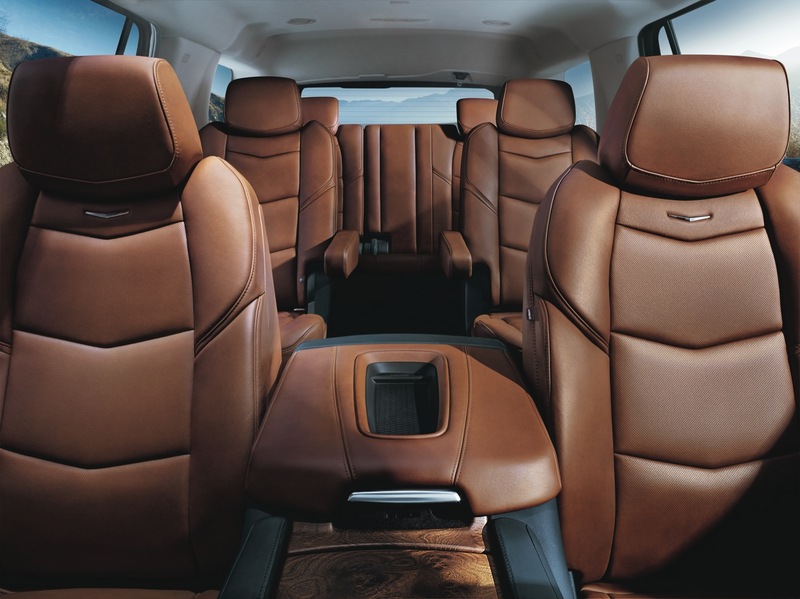 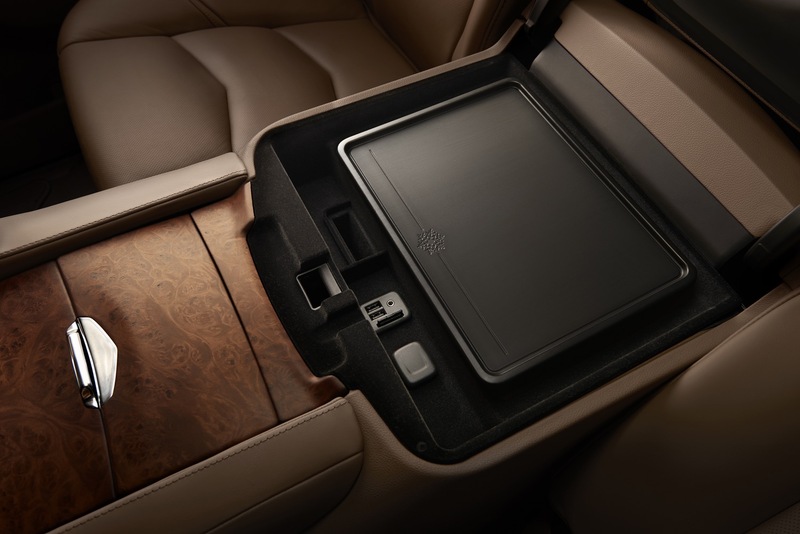 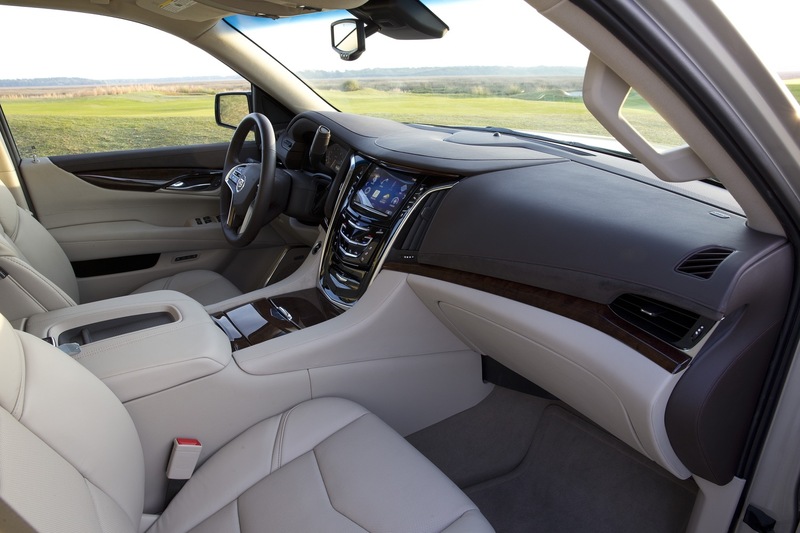 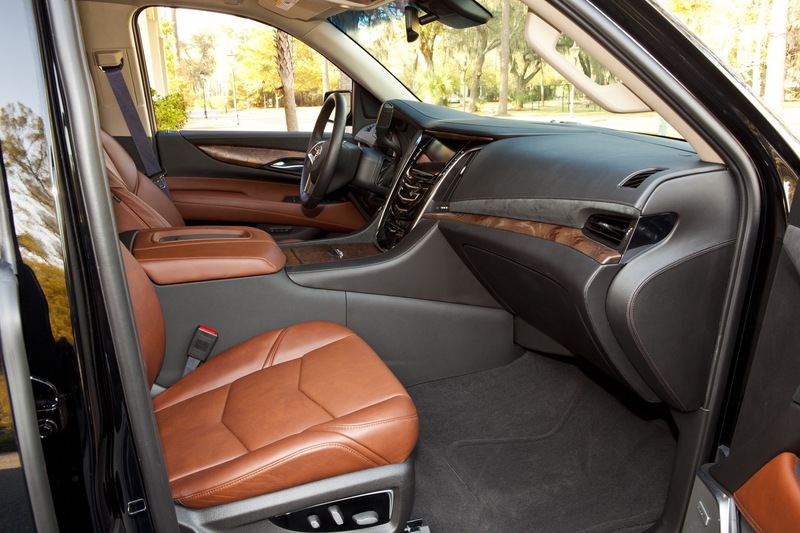 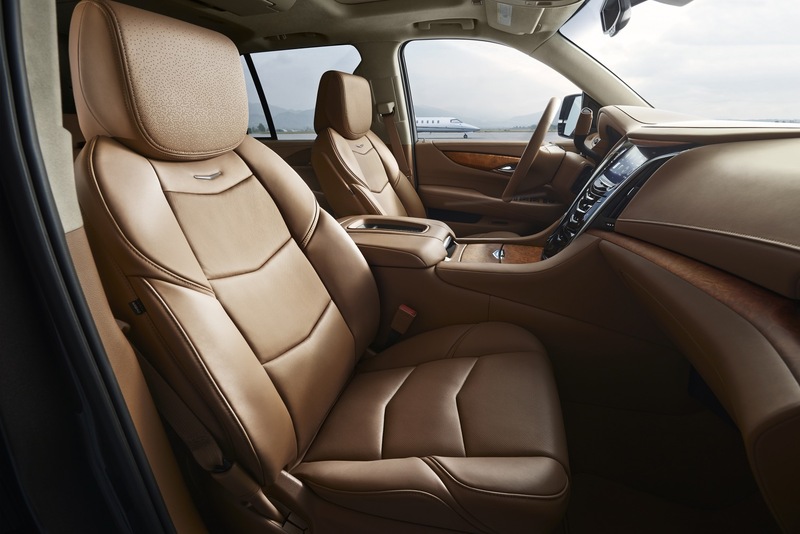 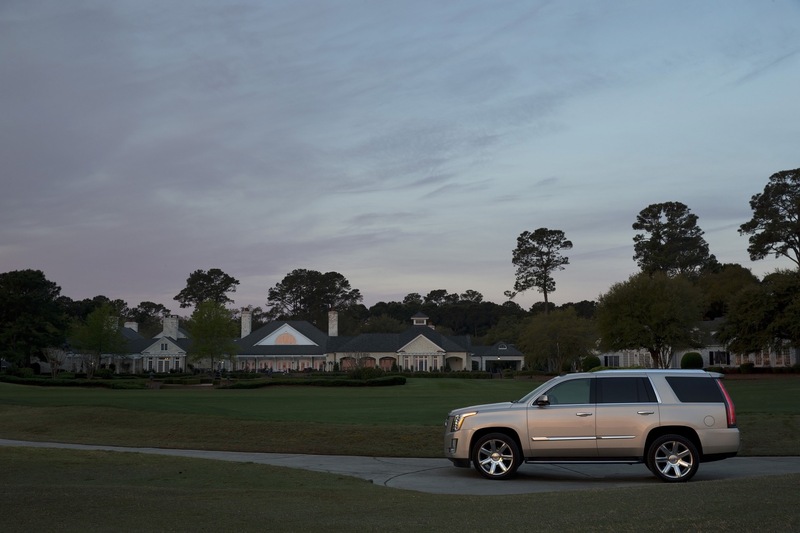 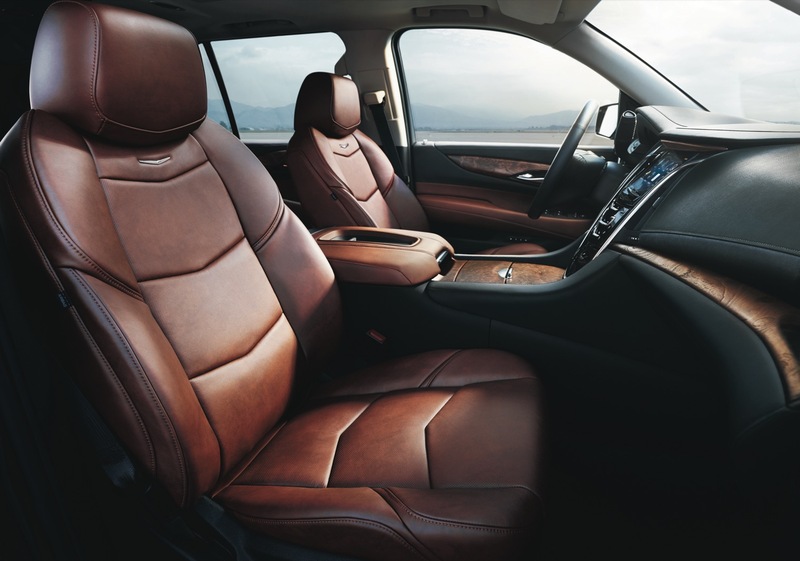 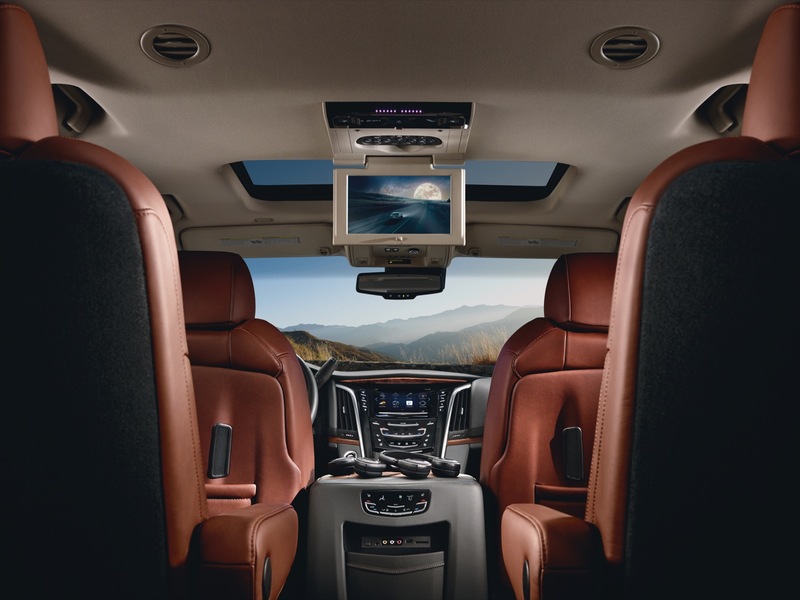 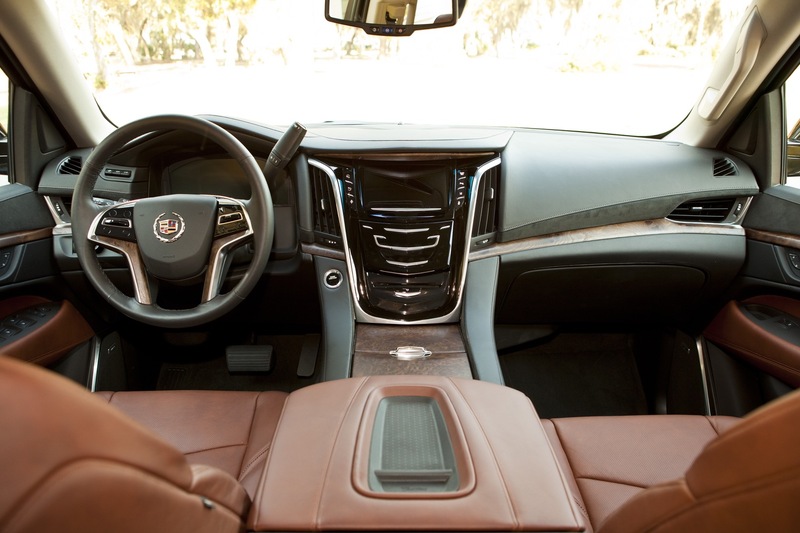 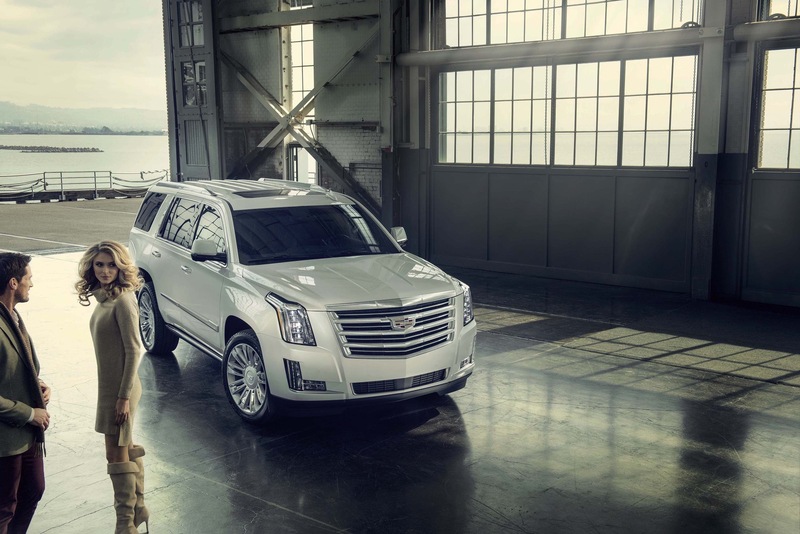 The interior of the 2015 Cadillac Escalade has improved the formula it was originally known for; assertive presence, innovative designs and spacious seating for eight in the package of a rumbling, uniquely American SUV. 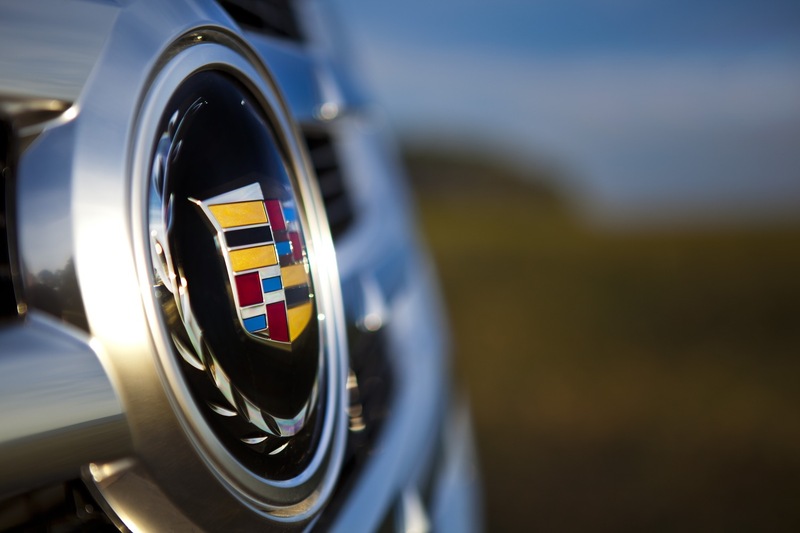 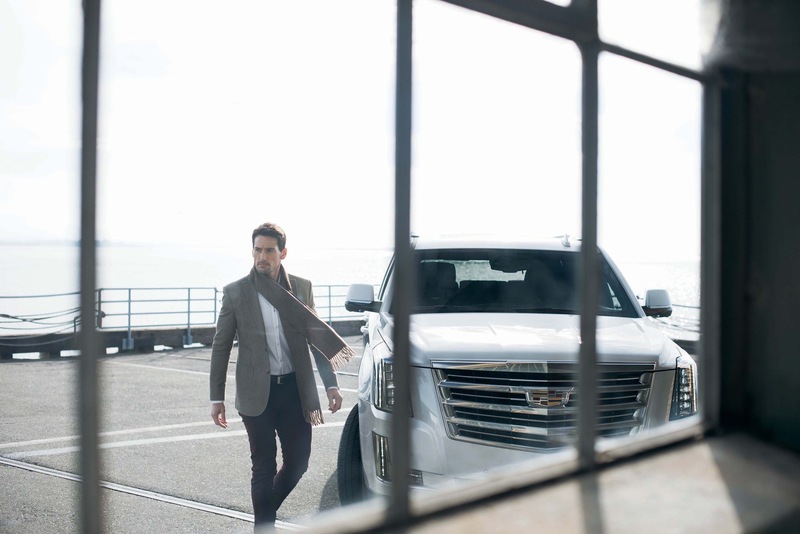 But like never before, Cadillac’s Art and Science design philosophy has managed to combine technological progression with traditional American luxury and style. 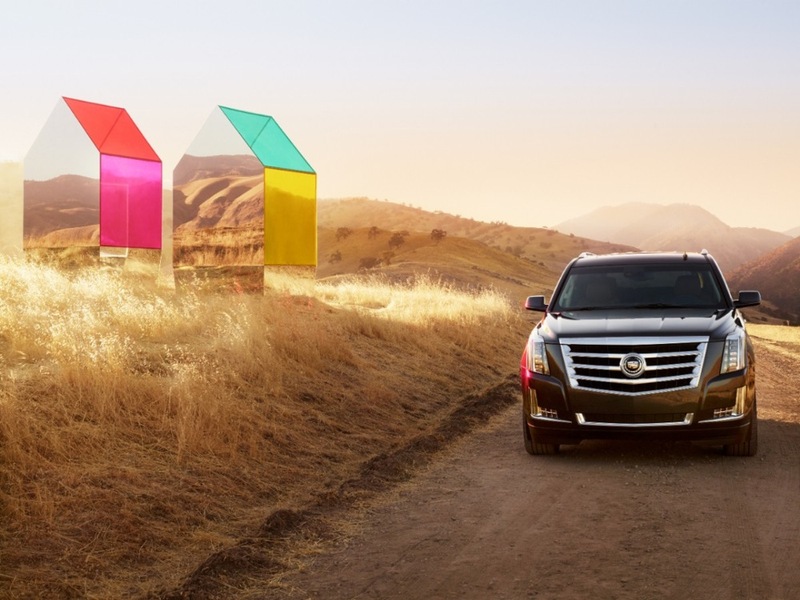 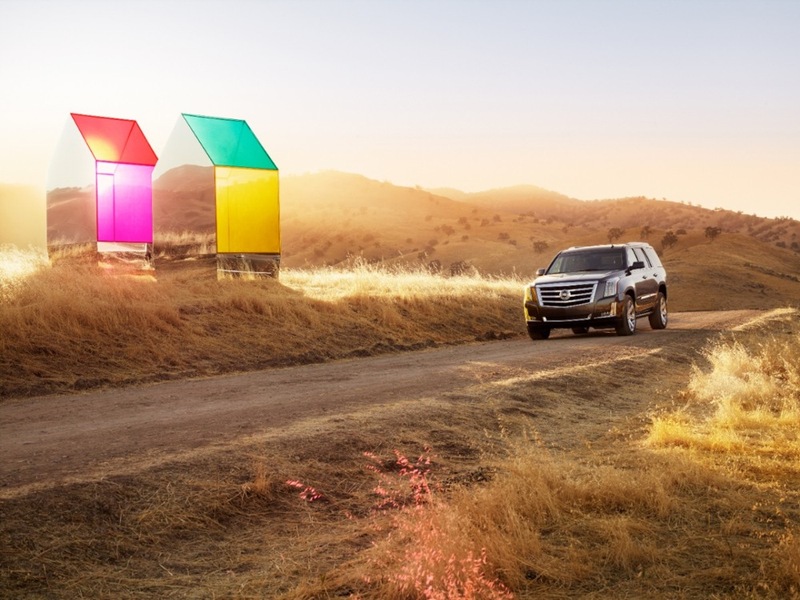 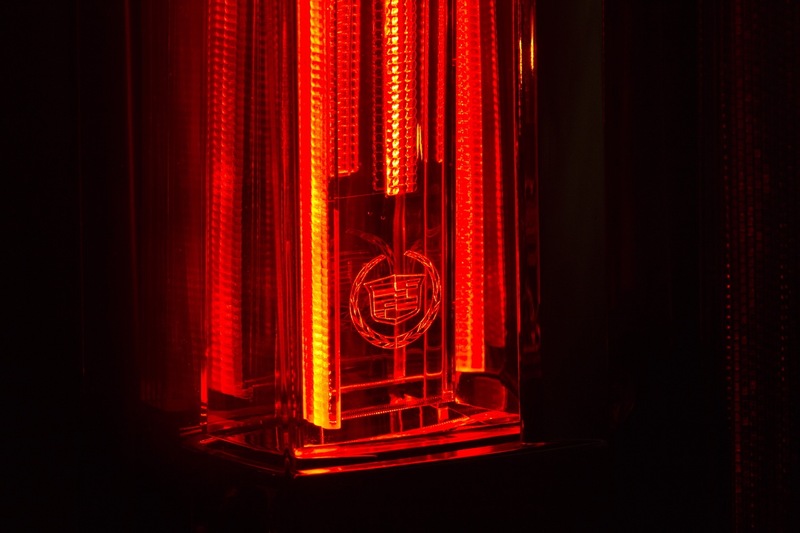 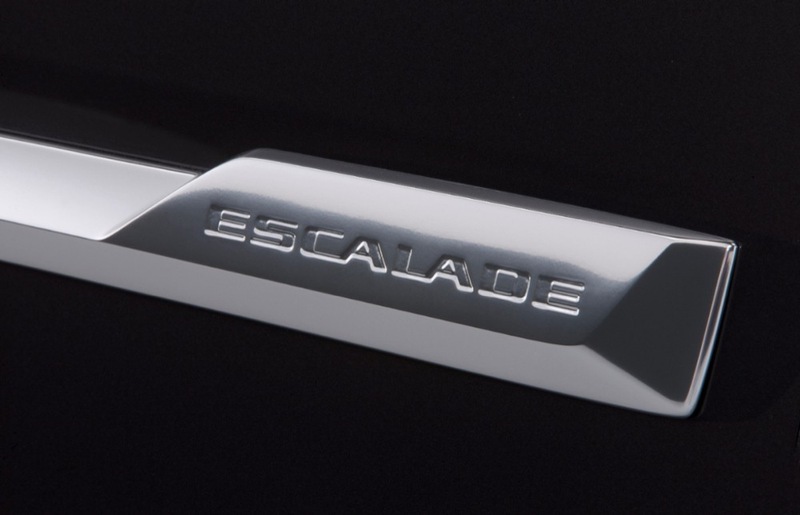 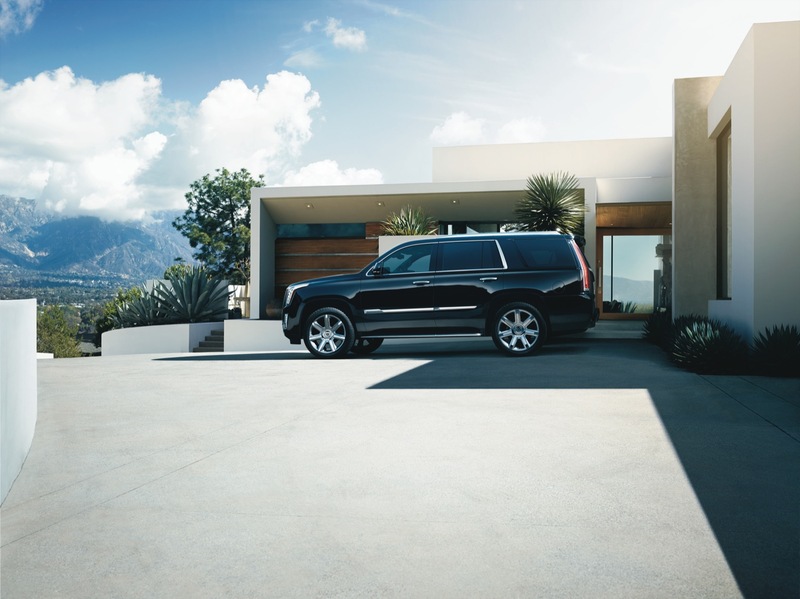 The concepts for the new Escalade were inspired by interior home engineering. 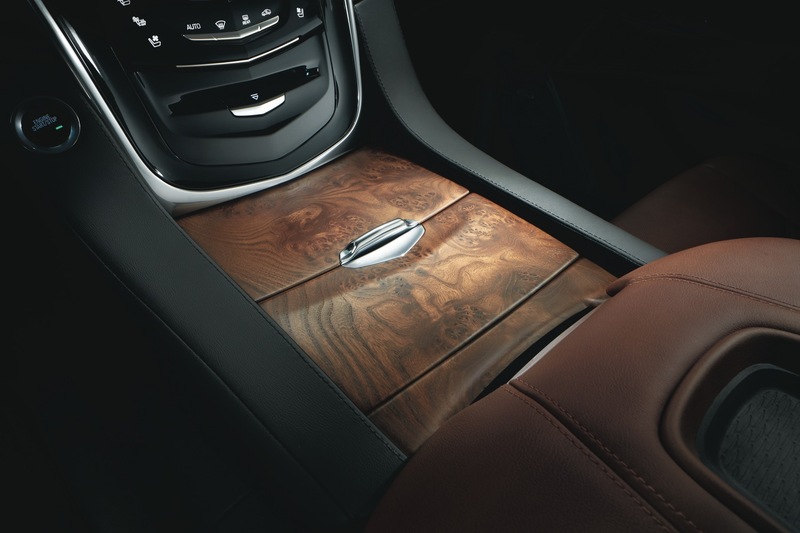 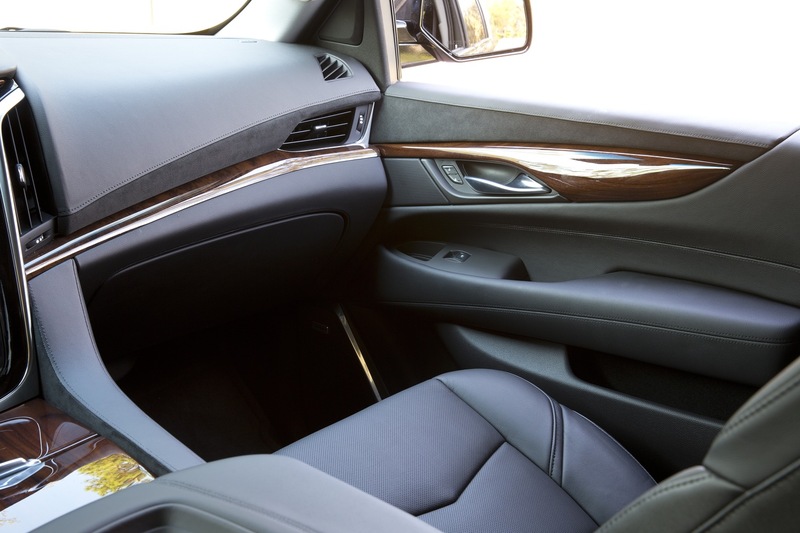 It includes charming authentic materials like palpable wood, leather and metals, aiming to create a connection between the vehicle and the discerning consumer it’s going after. 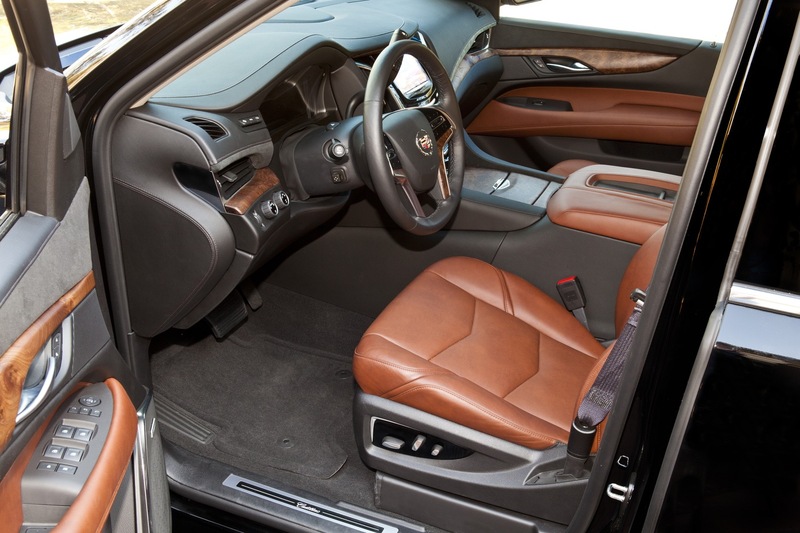 The fashion forward shopper most likely will be attracted to the black interior which features kona brown leather and open-pore elm cluster wood — stuff that they couldn’t fake even if they tried. 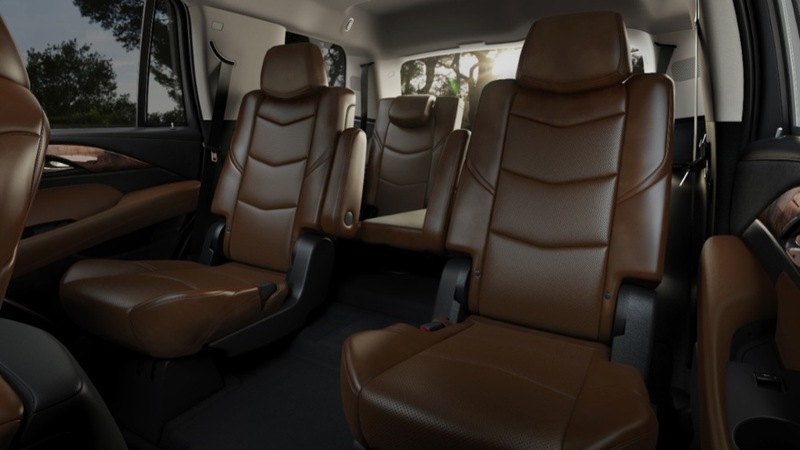 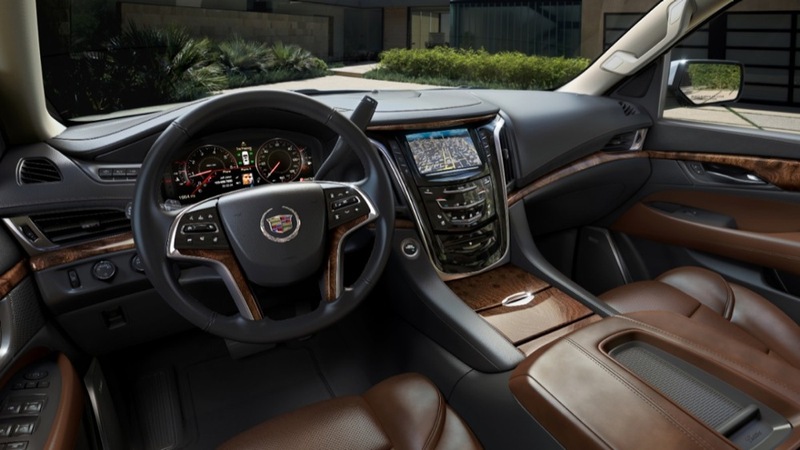 On the other hand, fans of the classic style Escalade will be more than satisfied with the light shale interior that offers traditional luxury execution with a complementary American walnut burl accents. 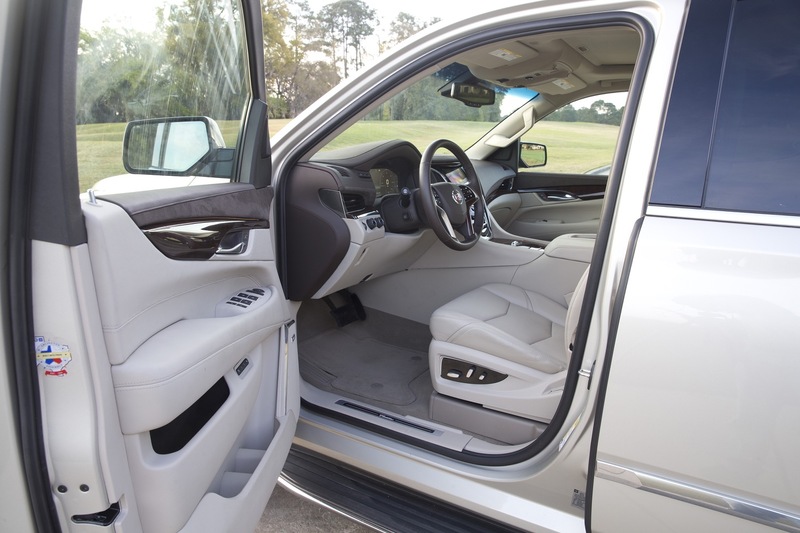 Furthermore, a cut and sew stitching process wraps and stitches prime leather and other materials on the instrument and door panels, center console and other interior components. 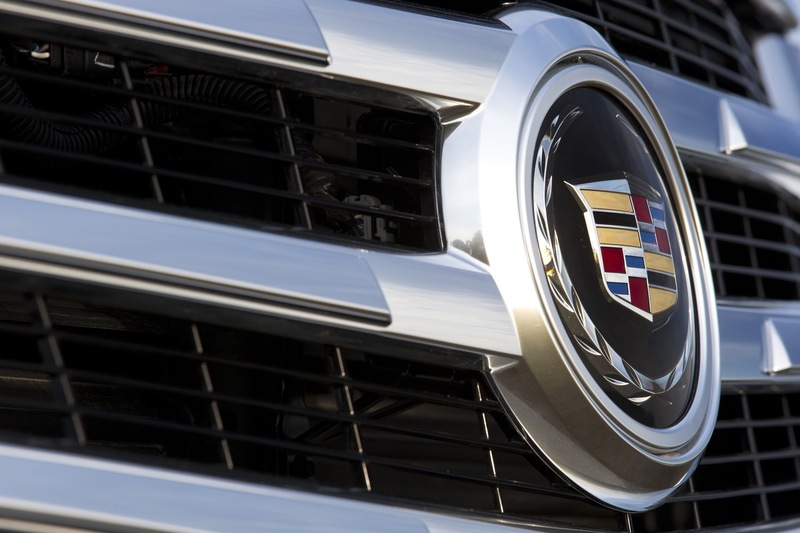 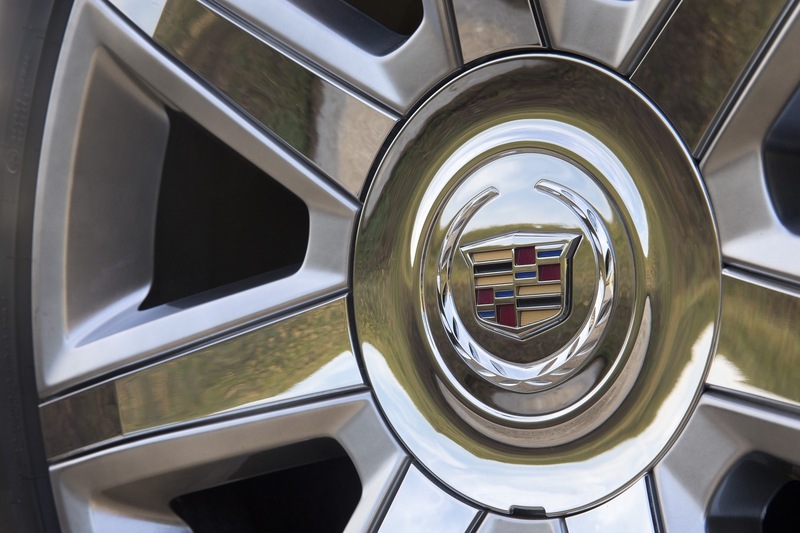 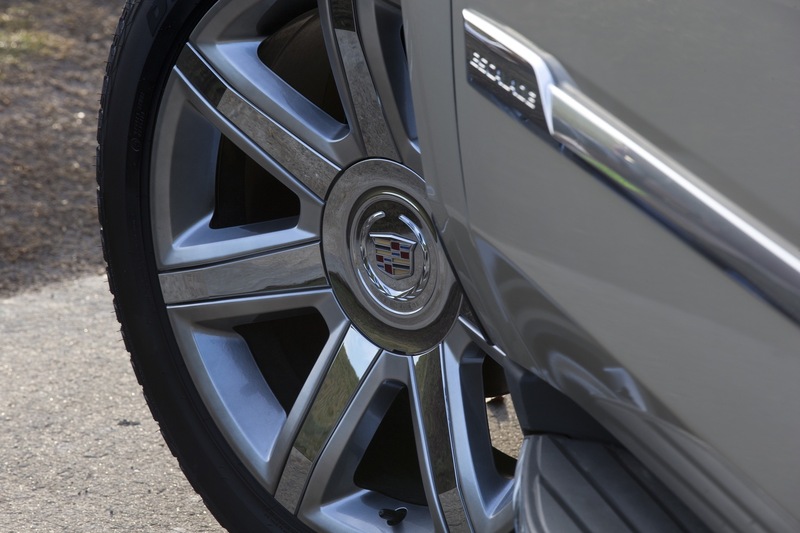 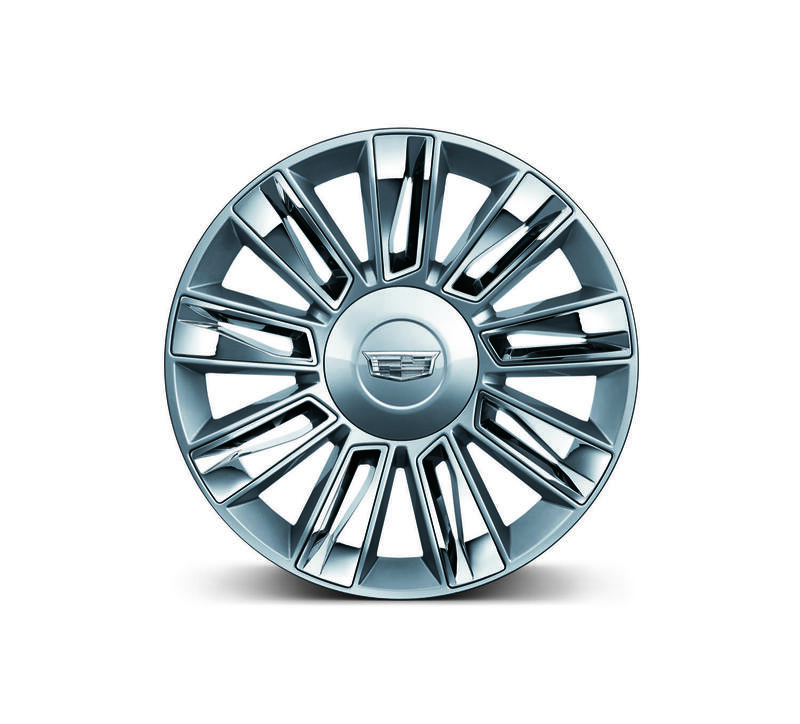 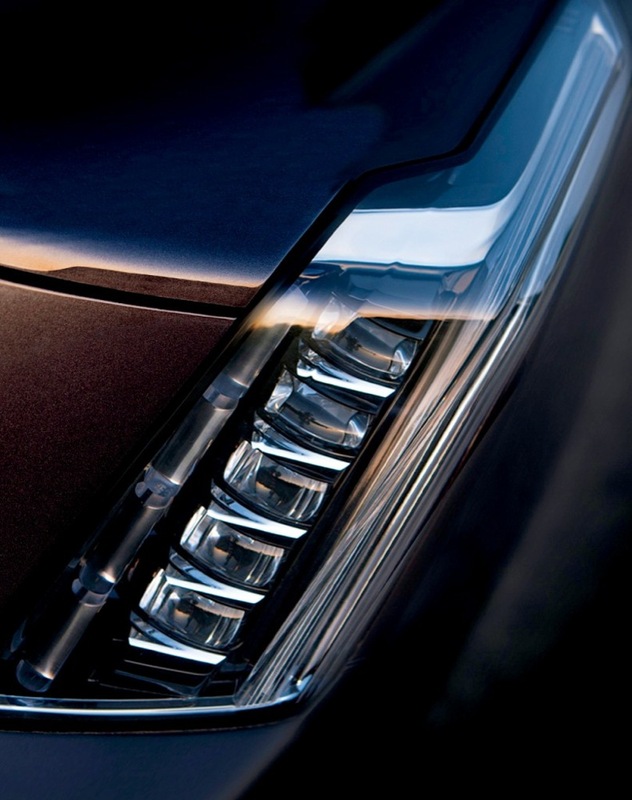 Finally, the Cadillac User Experience (CUE) is like the cherry on top of a delicious sundae. 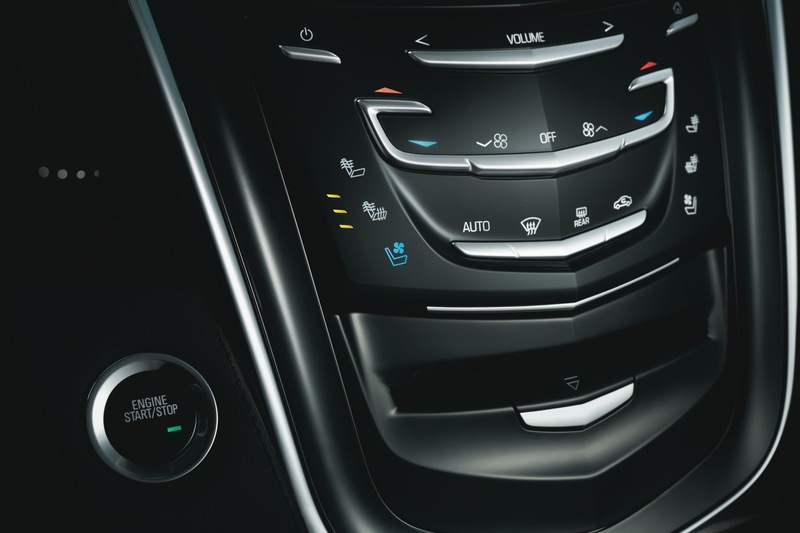 This innovative technology fuses connectivity, convenience, control and convergence. 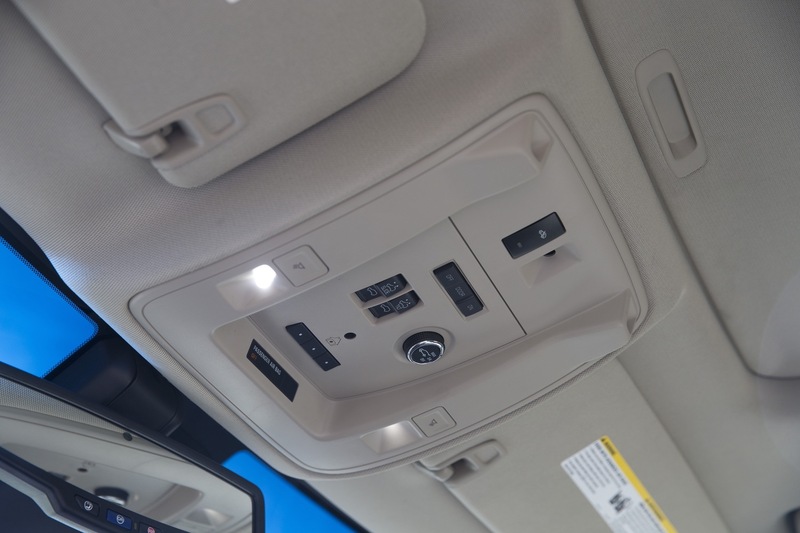 Connecting a smartphone or iPod to the central portal brings communication, entertainment and navigation to the fingertips of the consumer. 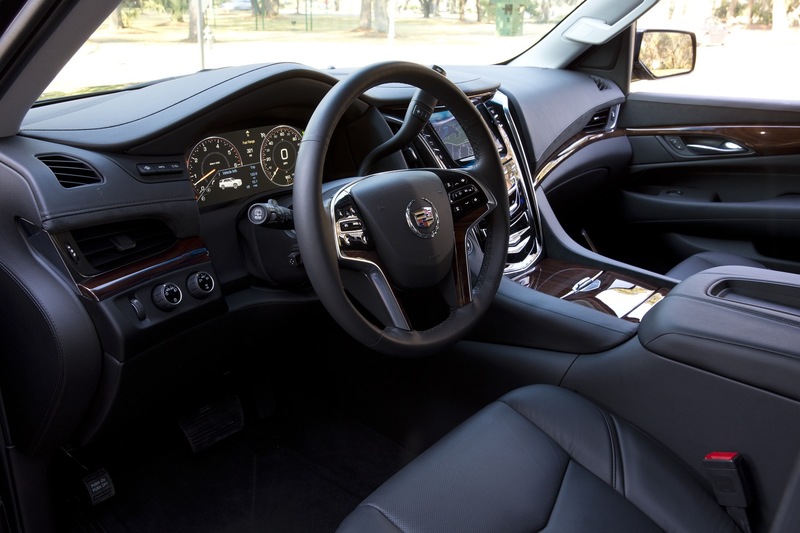 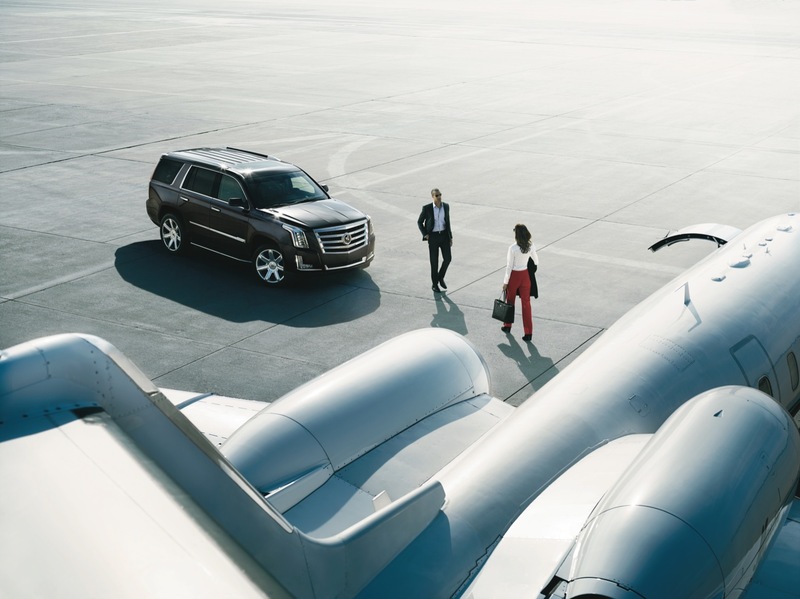 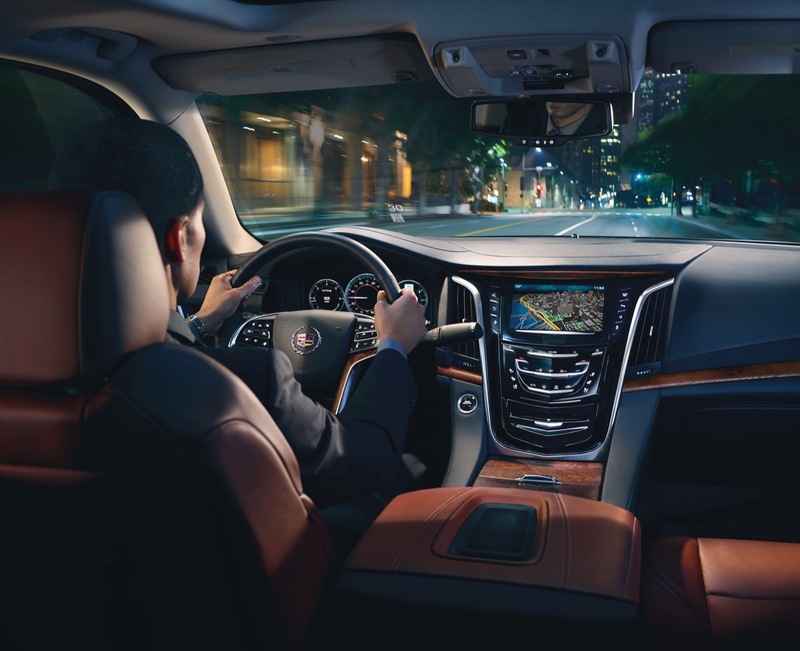 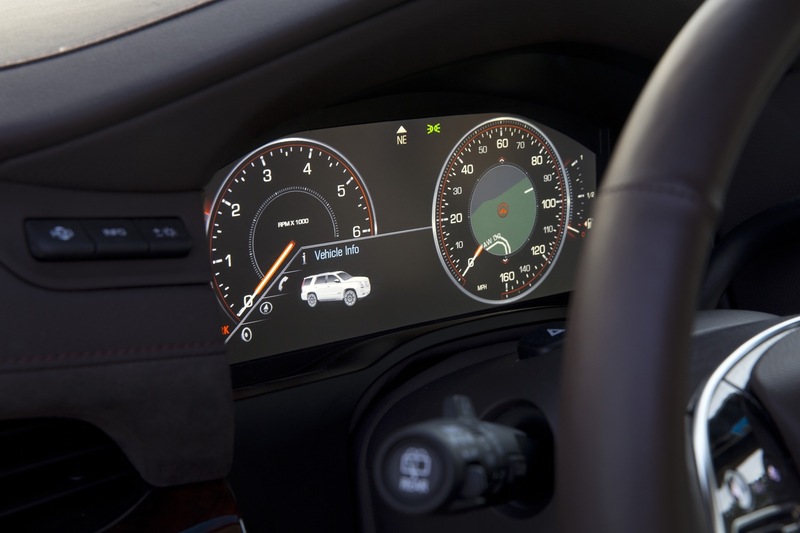 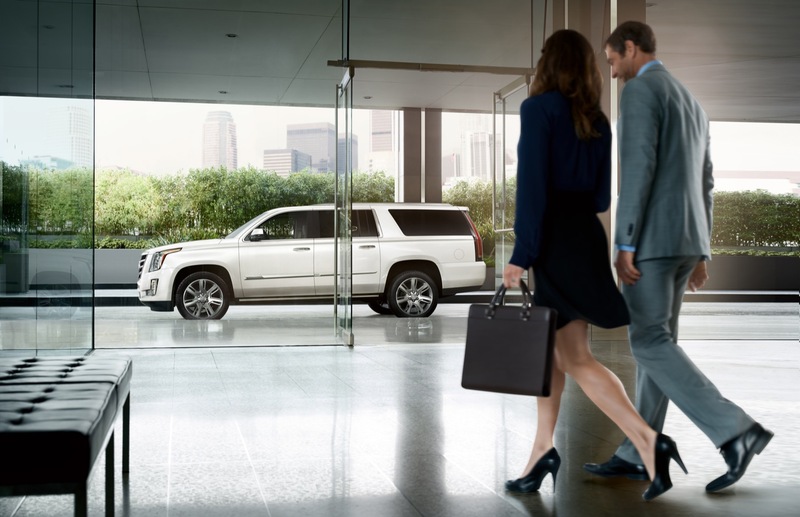 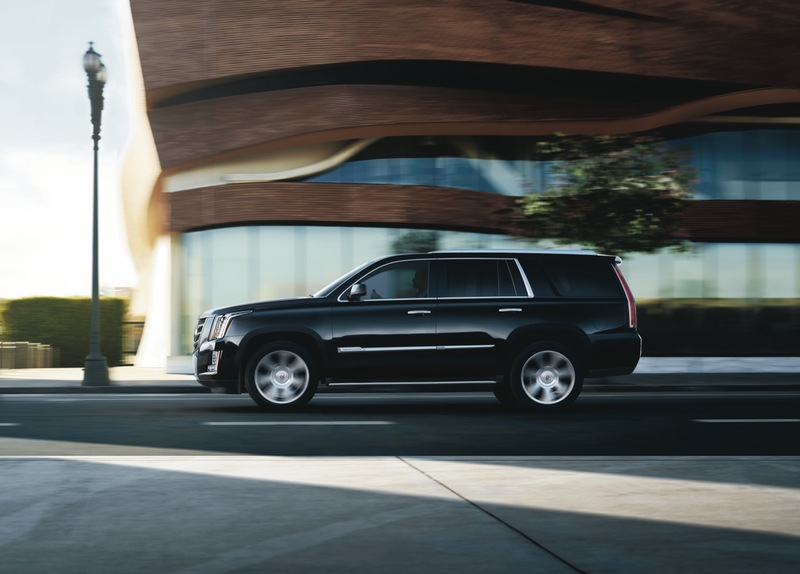 Additionally the revamped CUE system offers voice recognition and a touch screen that is three times faster than the previous touch screens of the Escalade. 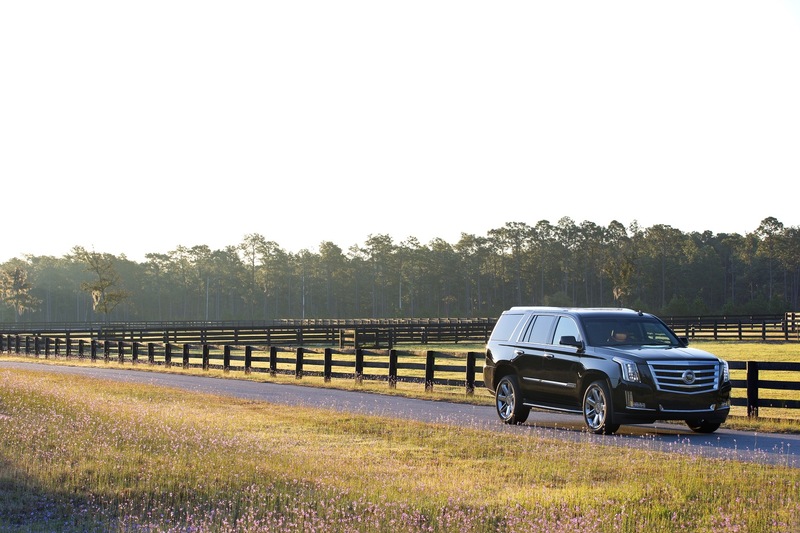 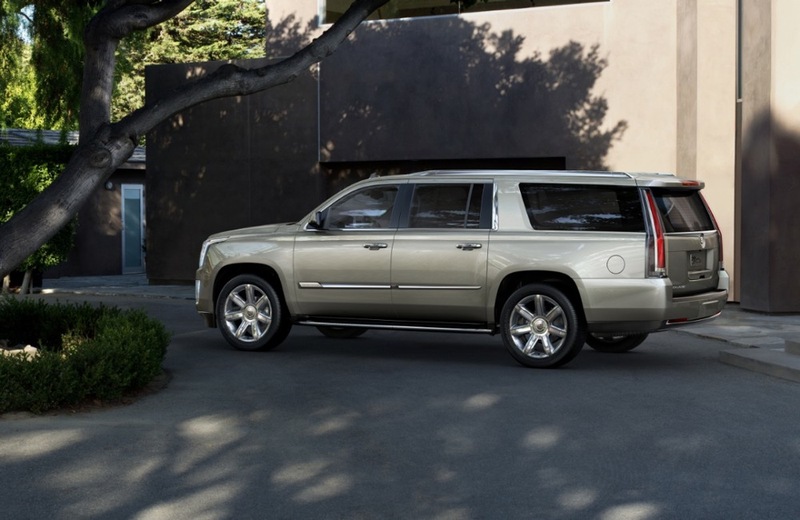 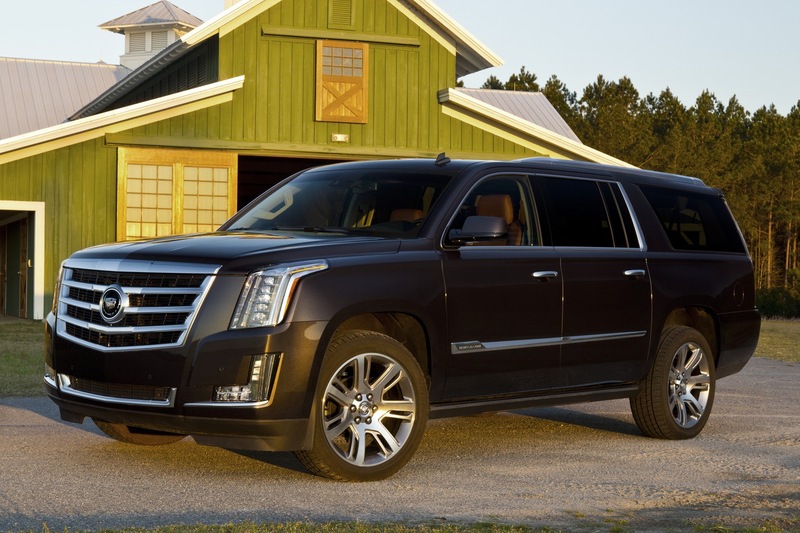 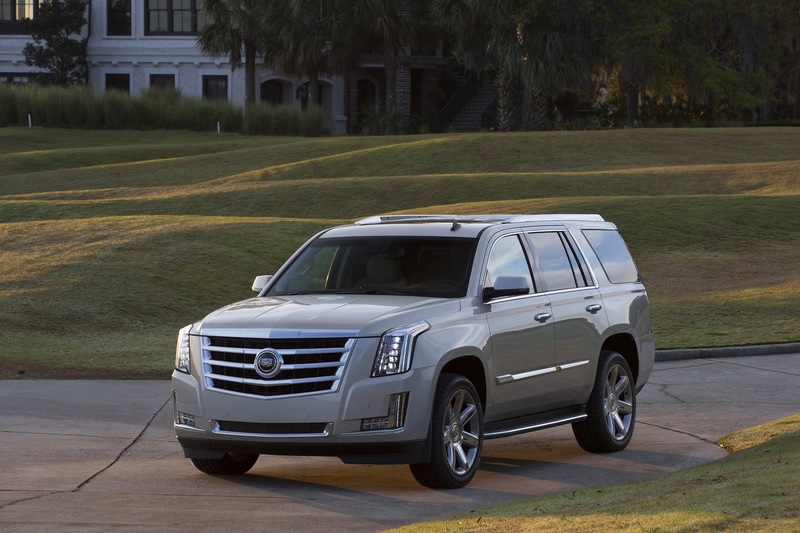 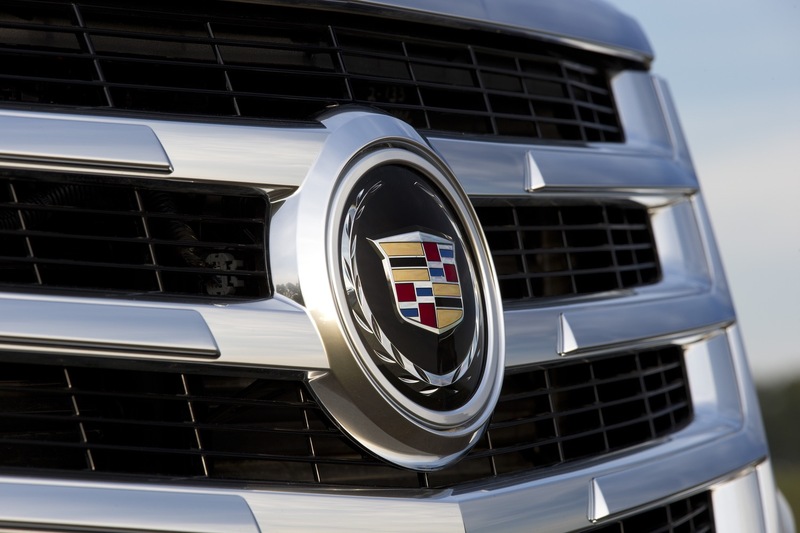 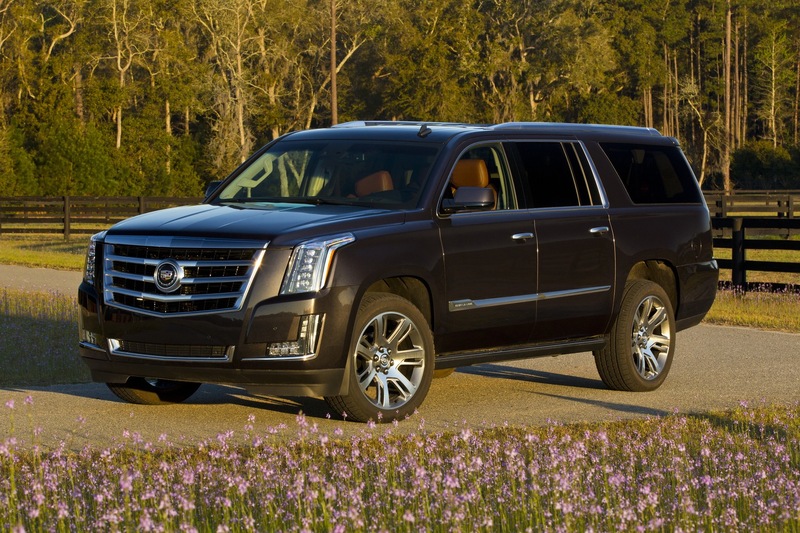 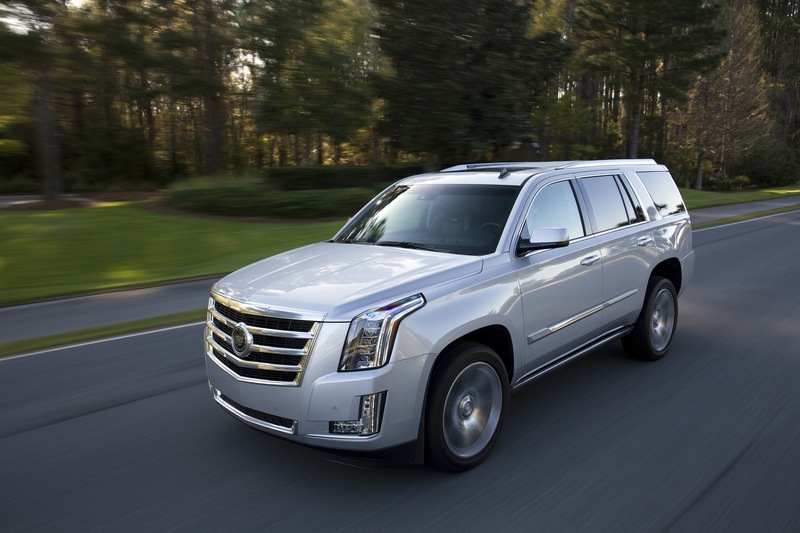 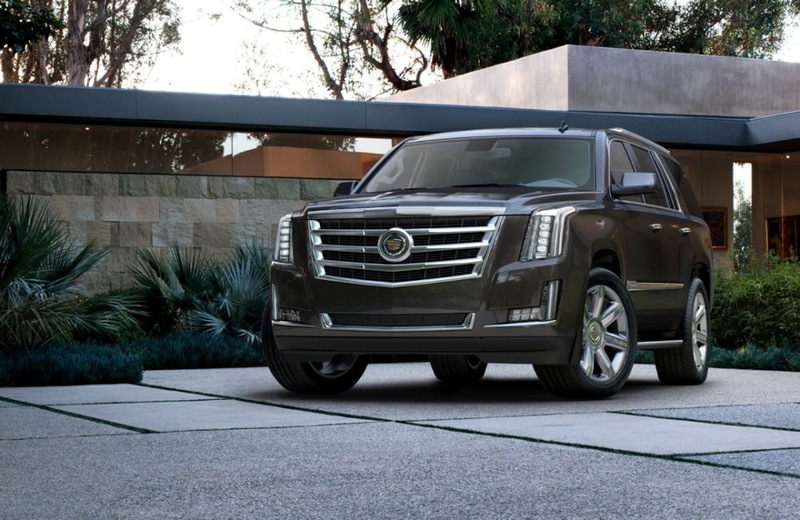 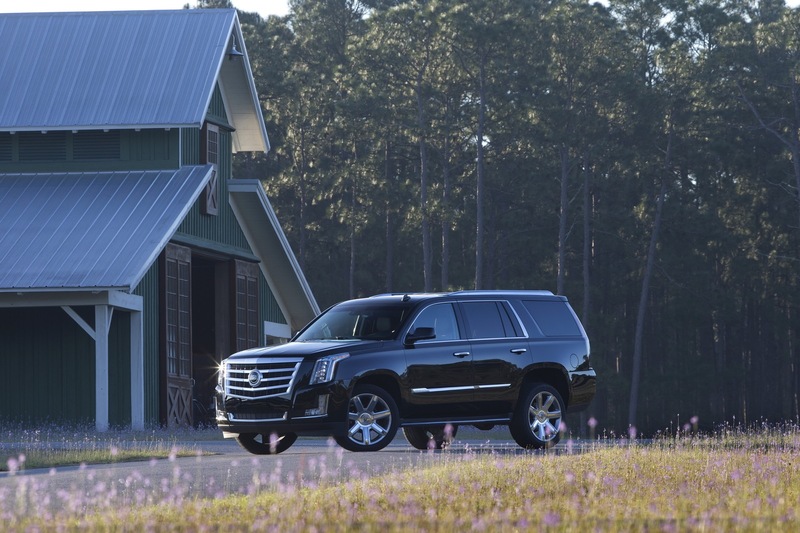 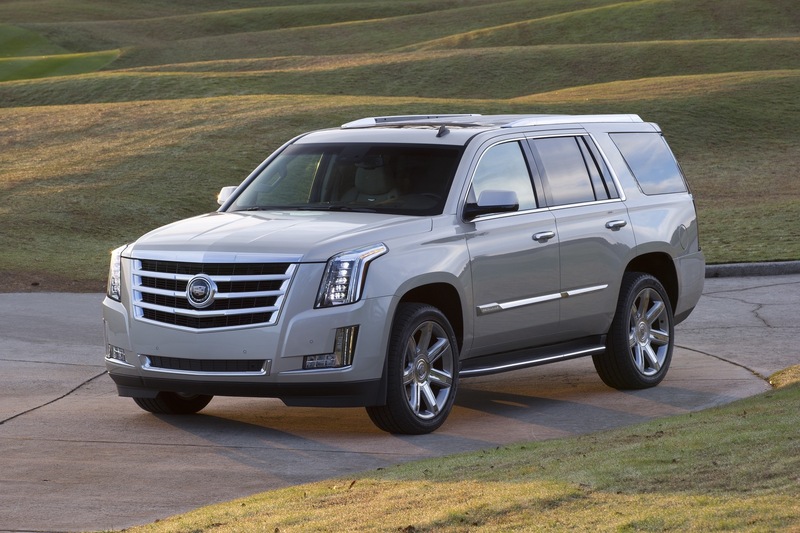 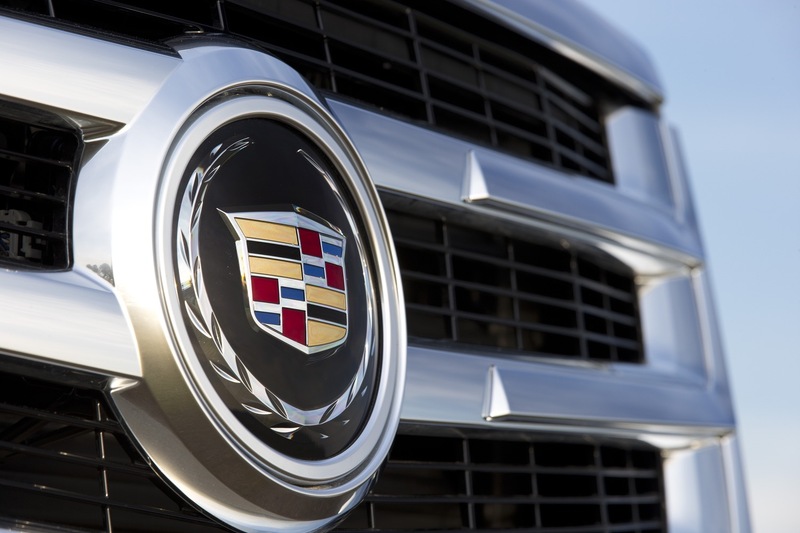 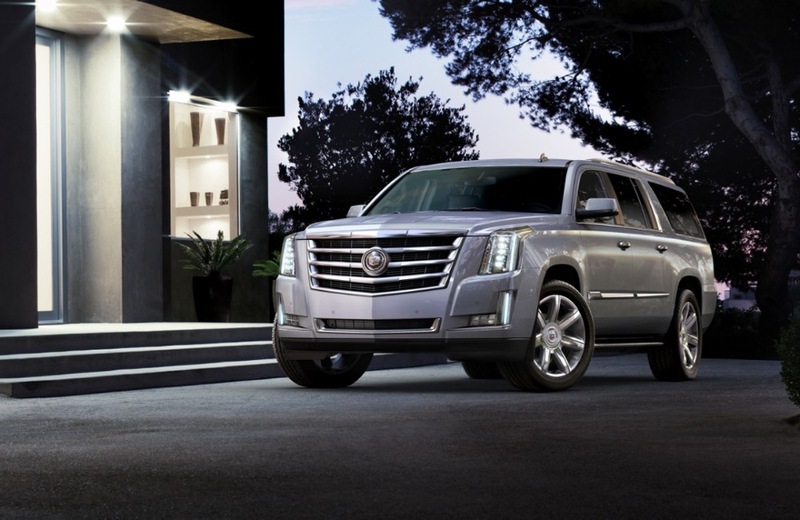 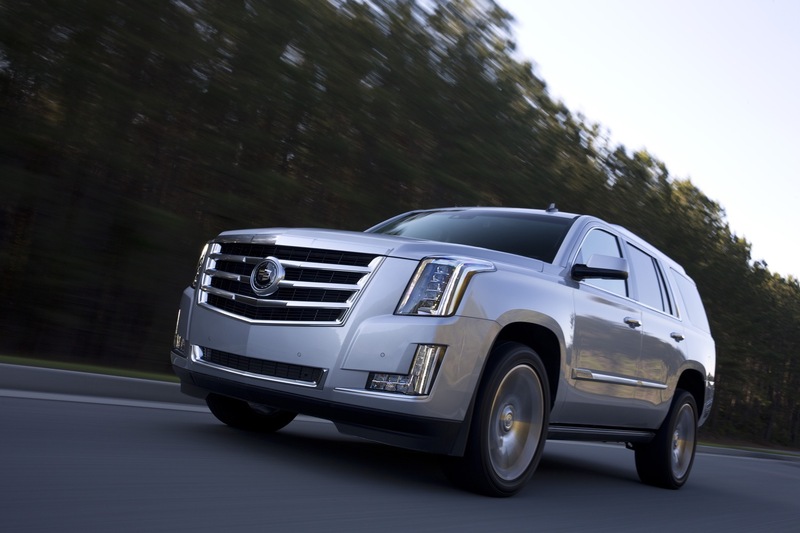 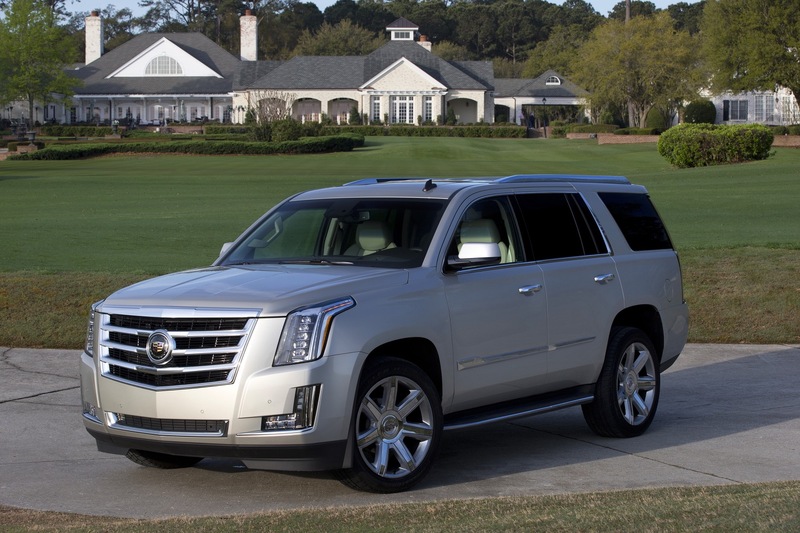 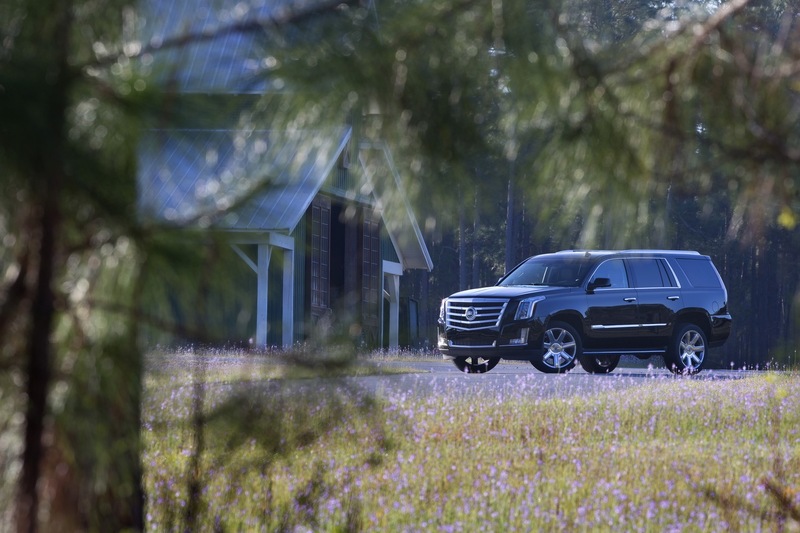 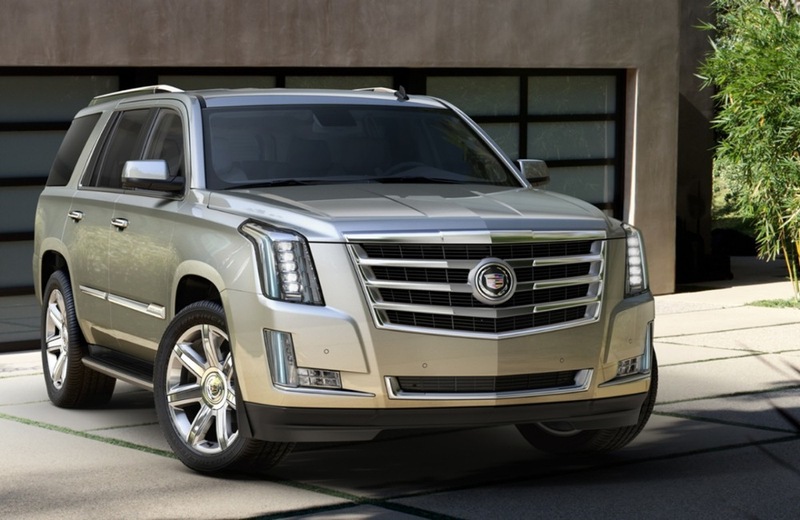 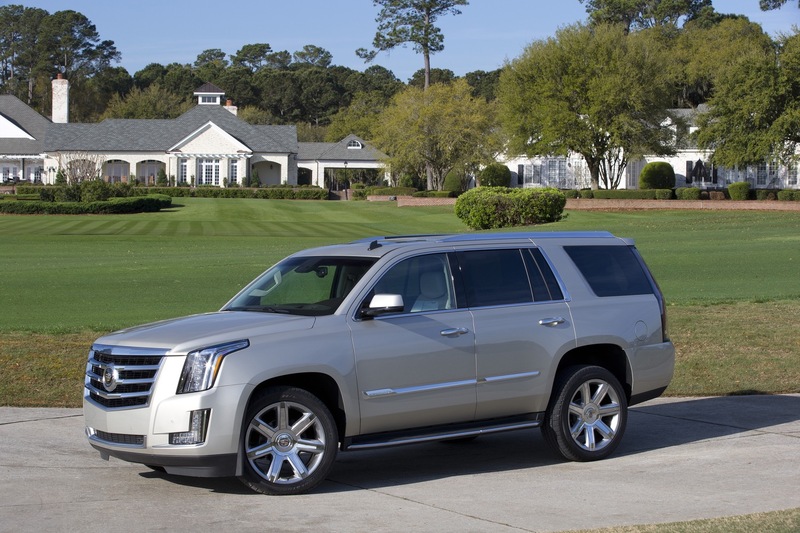 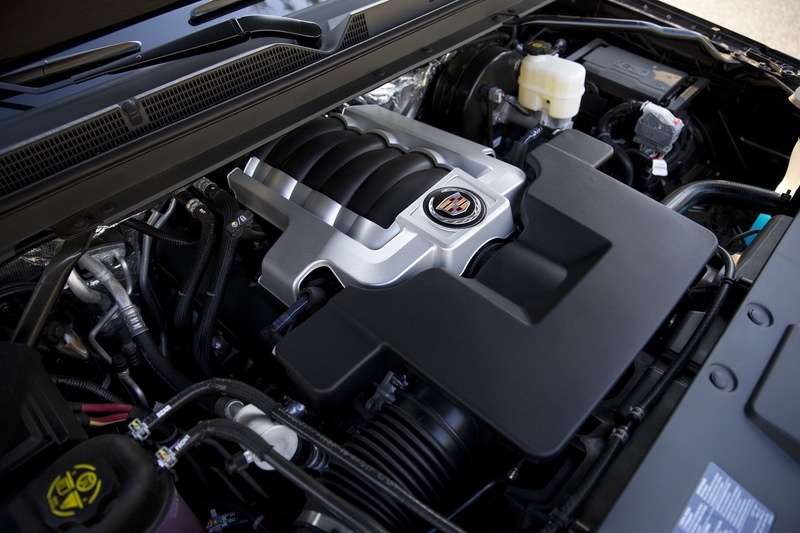 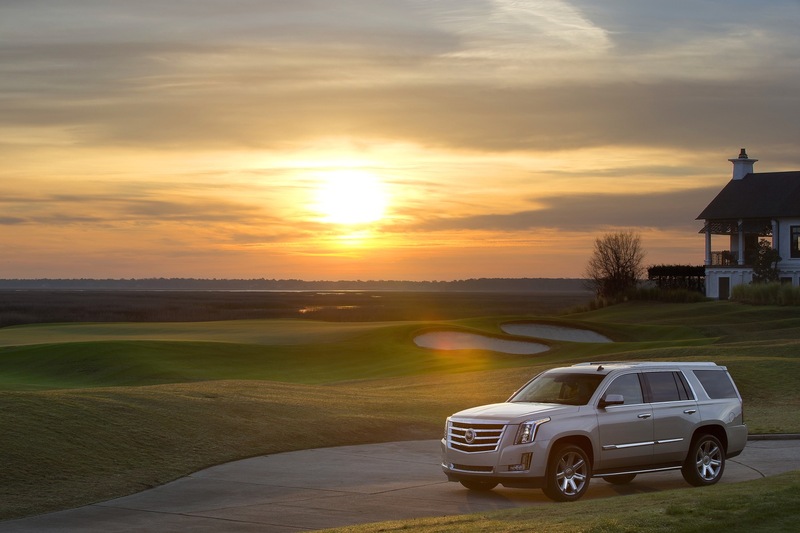 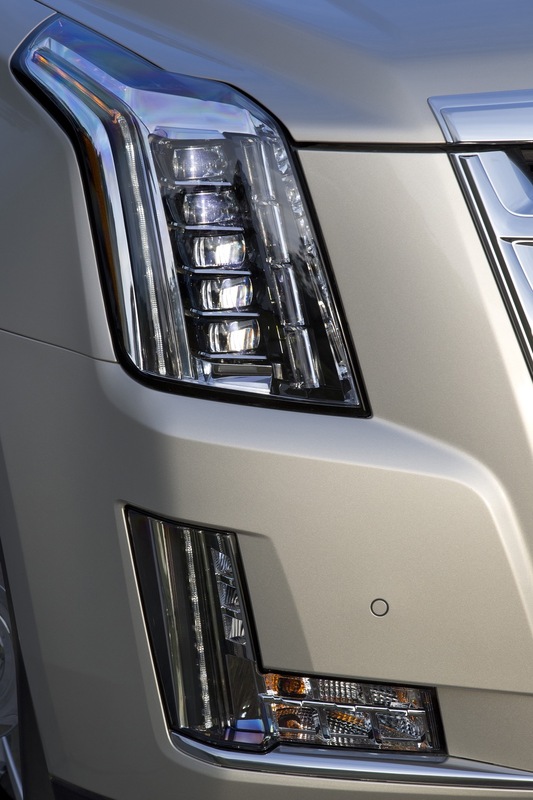 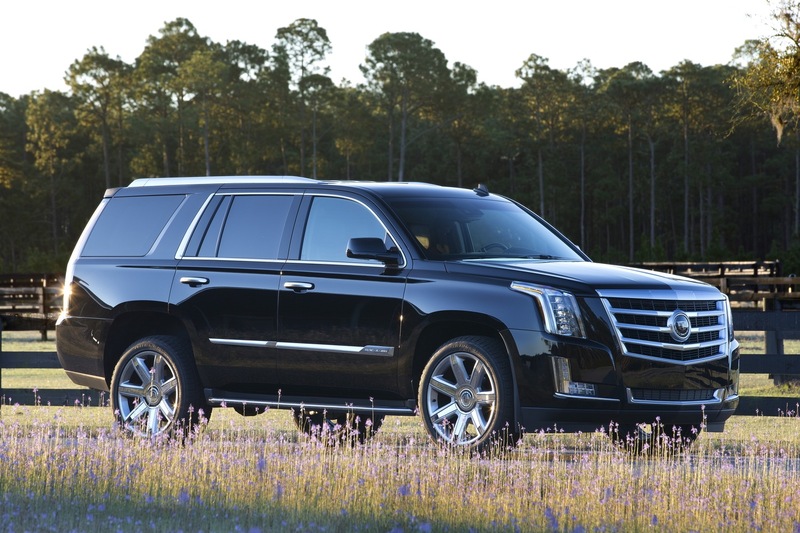 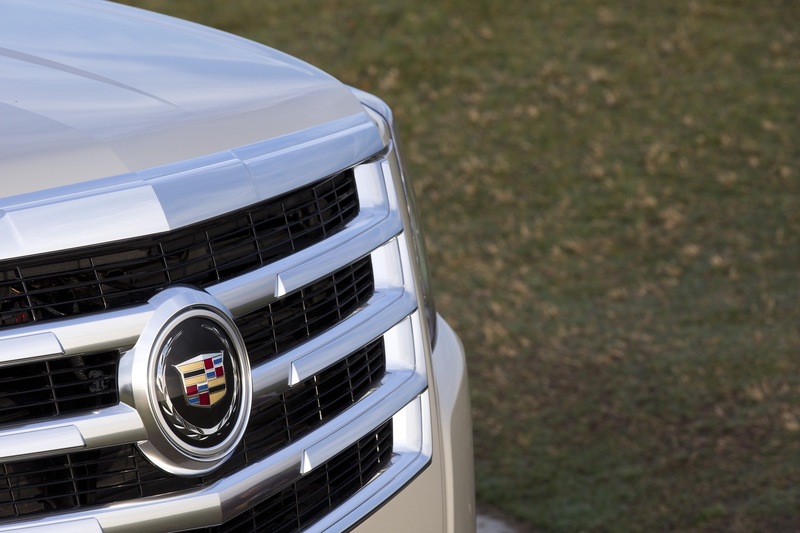 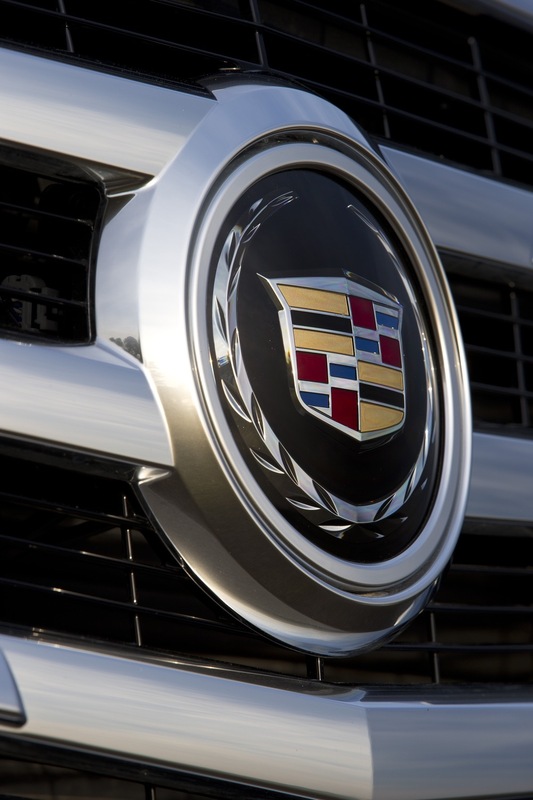 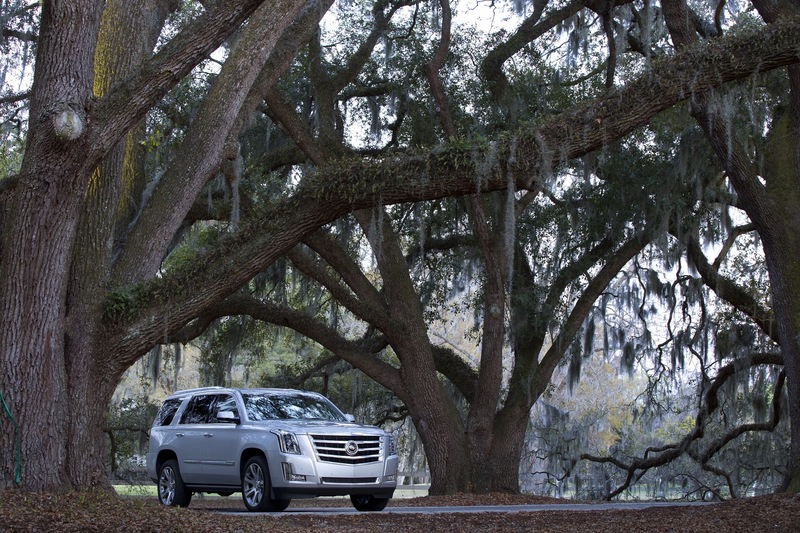 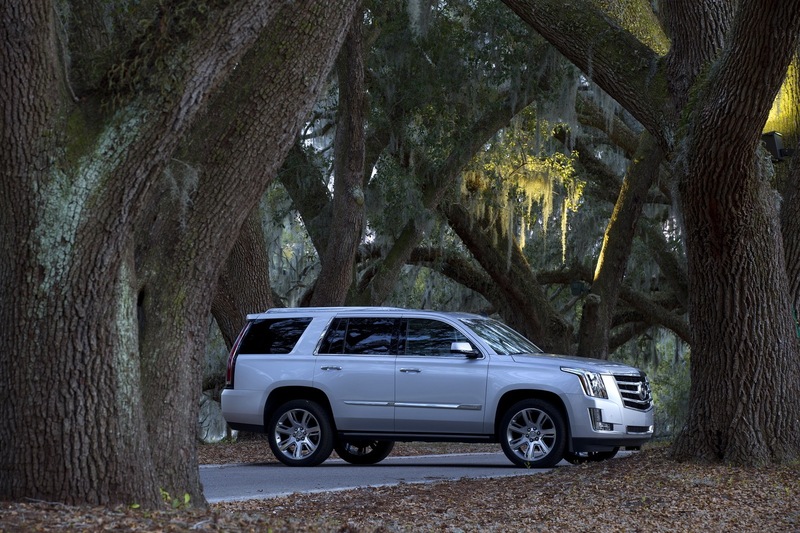 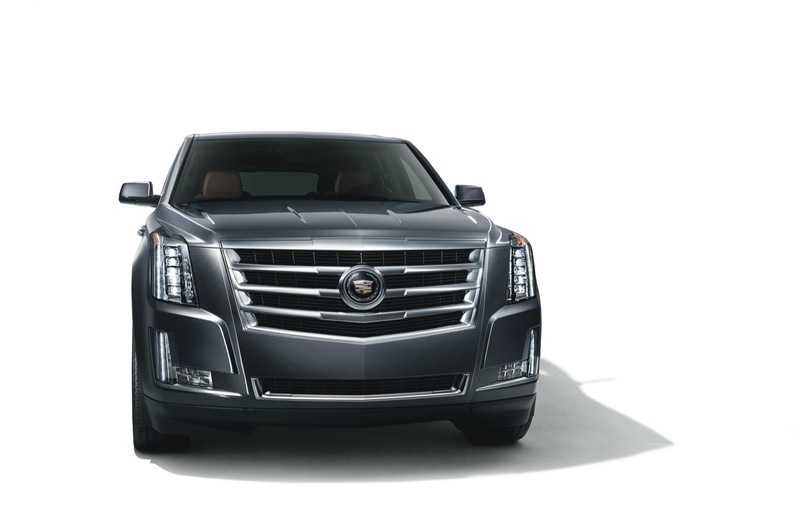 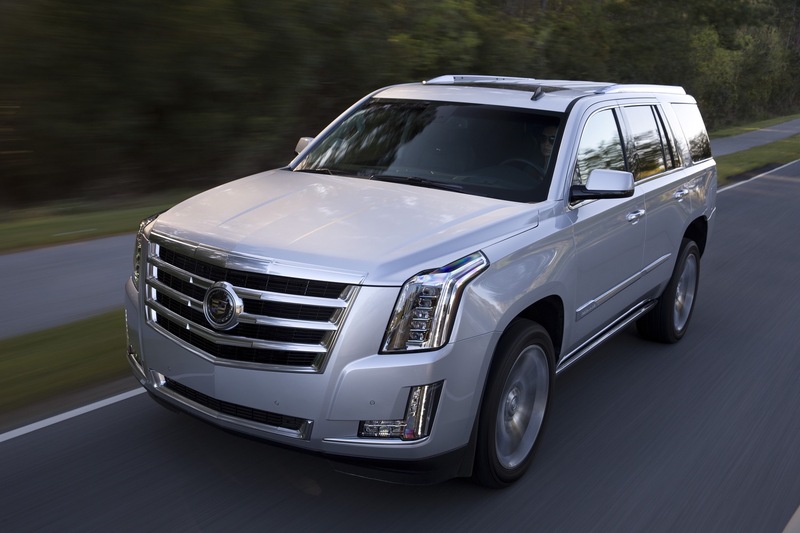 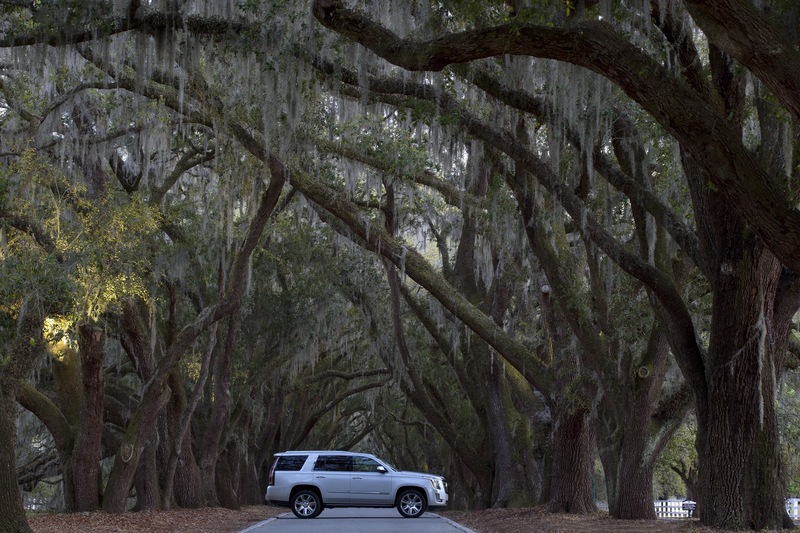 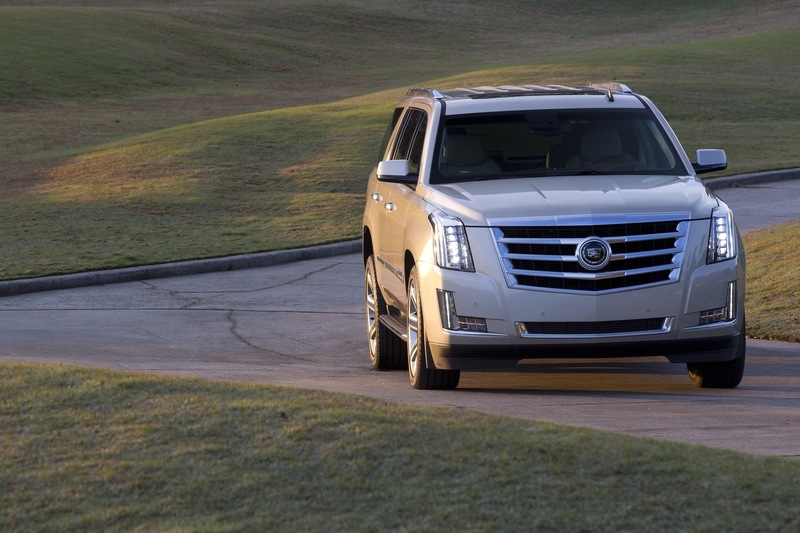 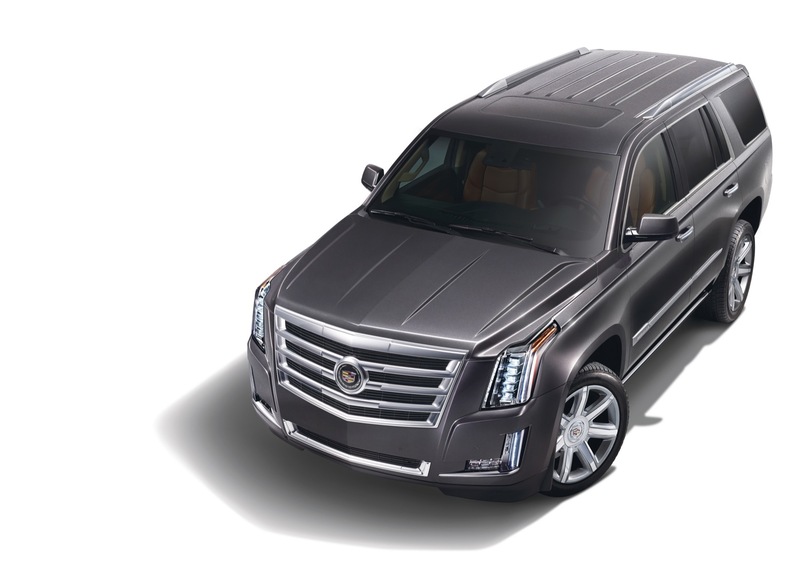 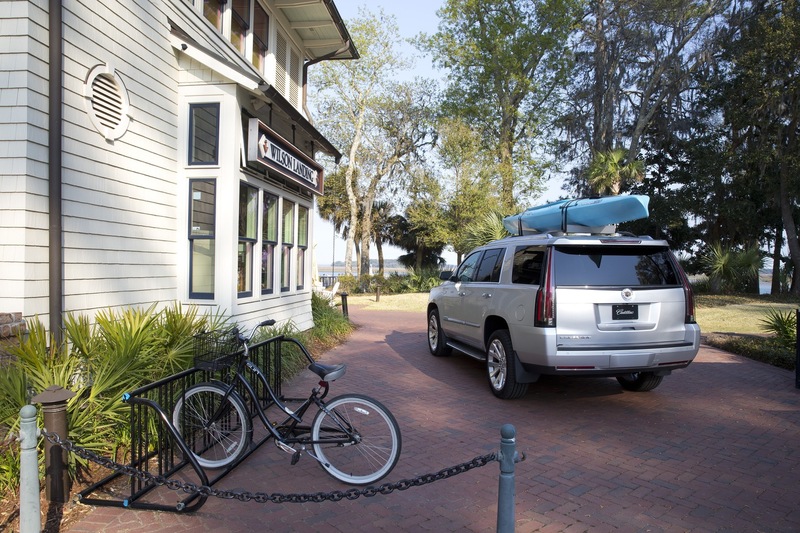 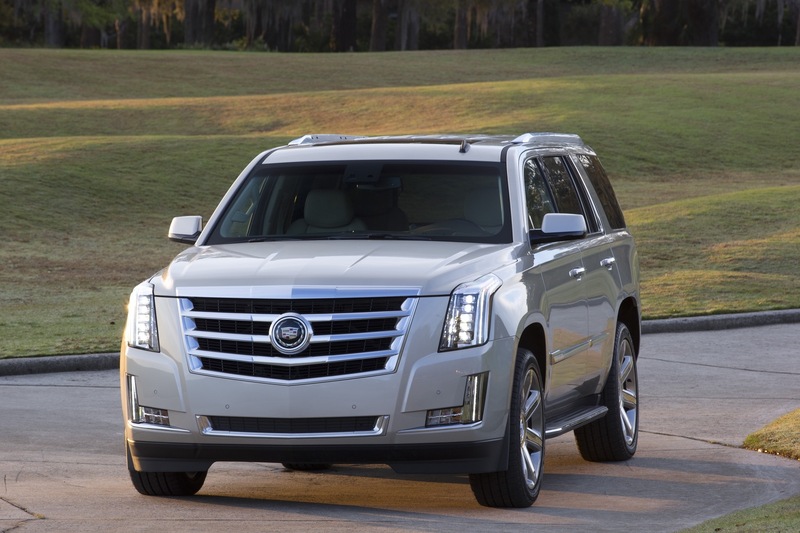 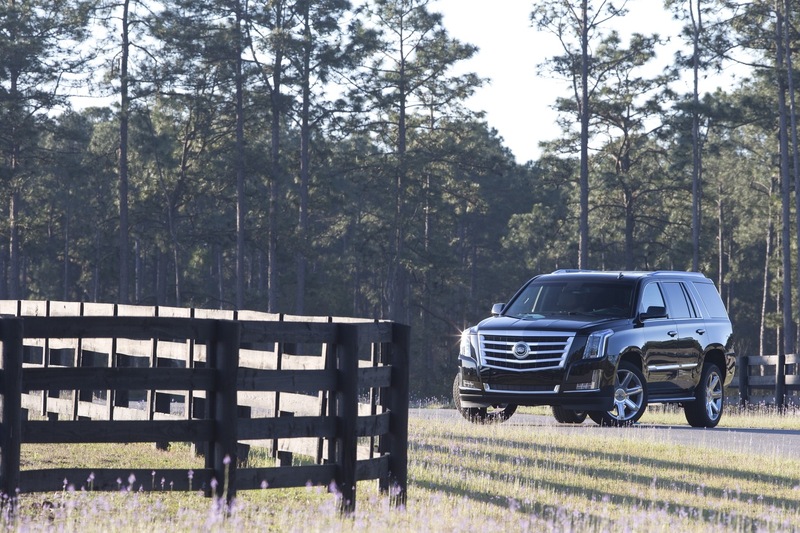 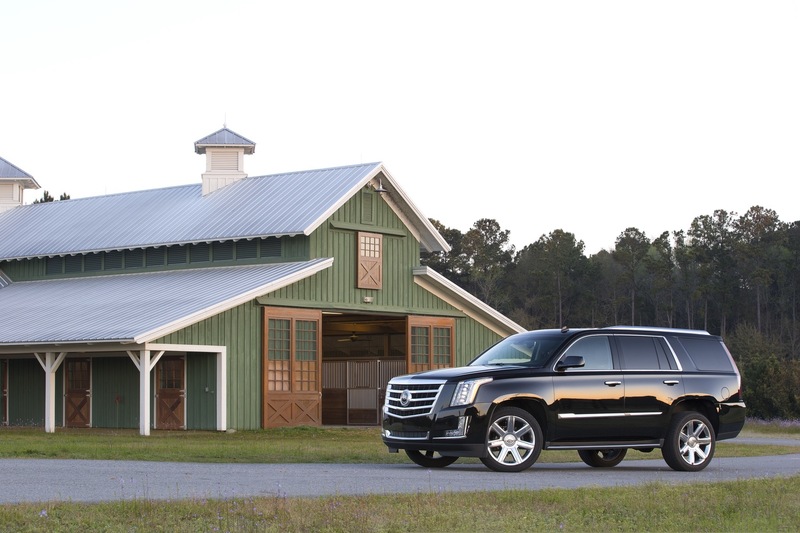 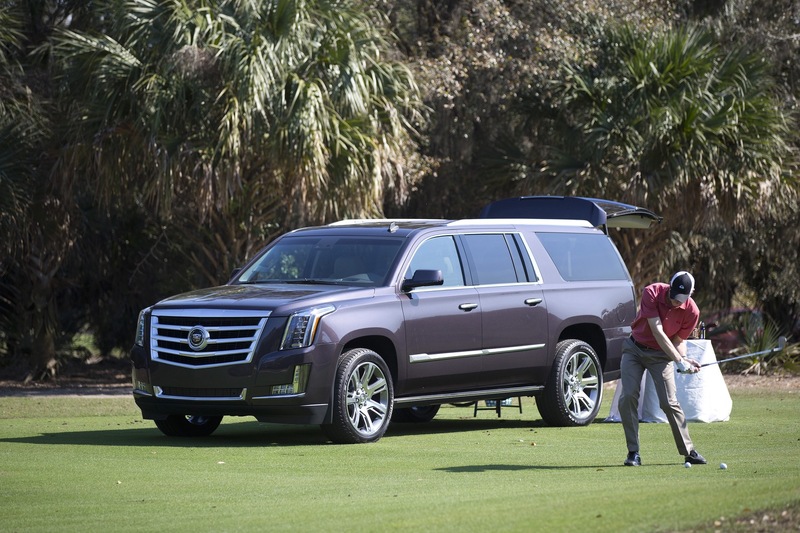 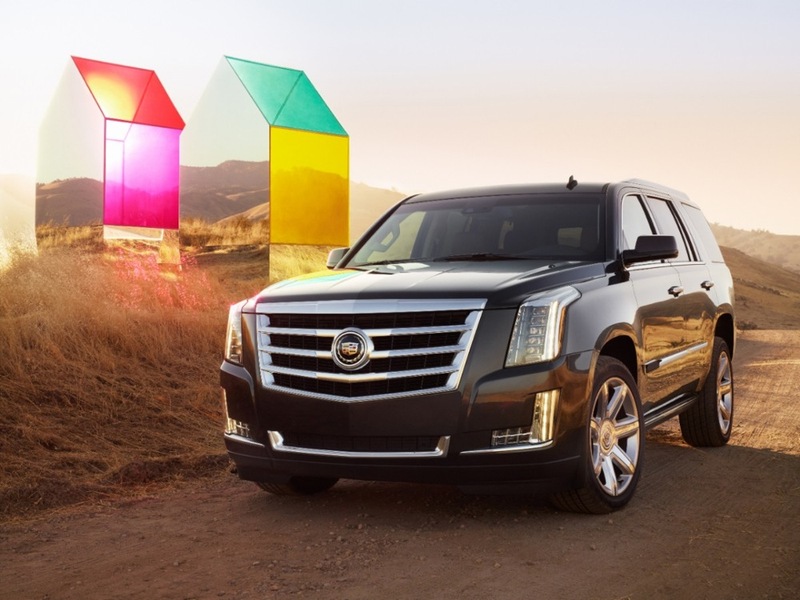 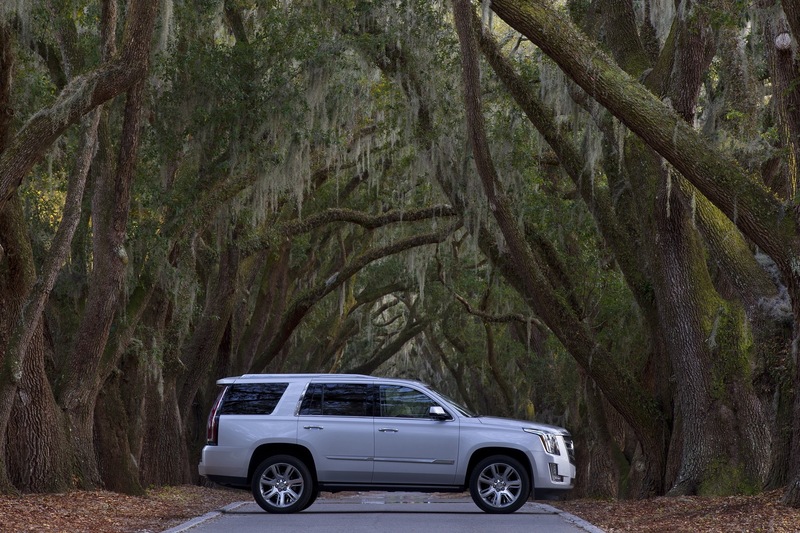 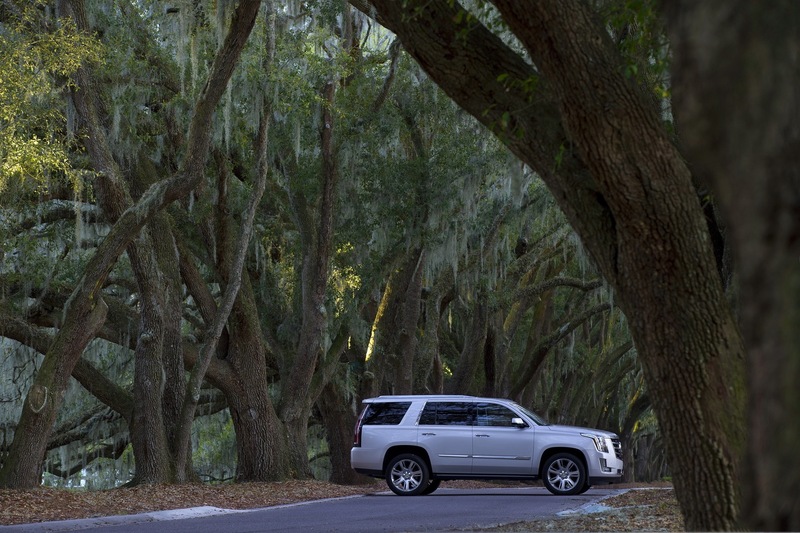 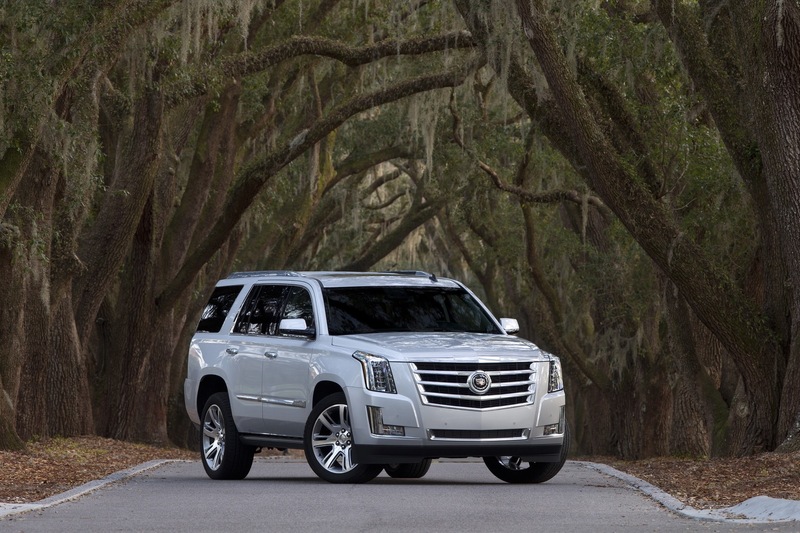 As far as pricing goes, the 2015 Escalade is expected to start at just under $72,000. 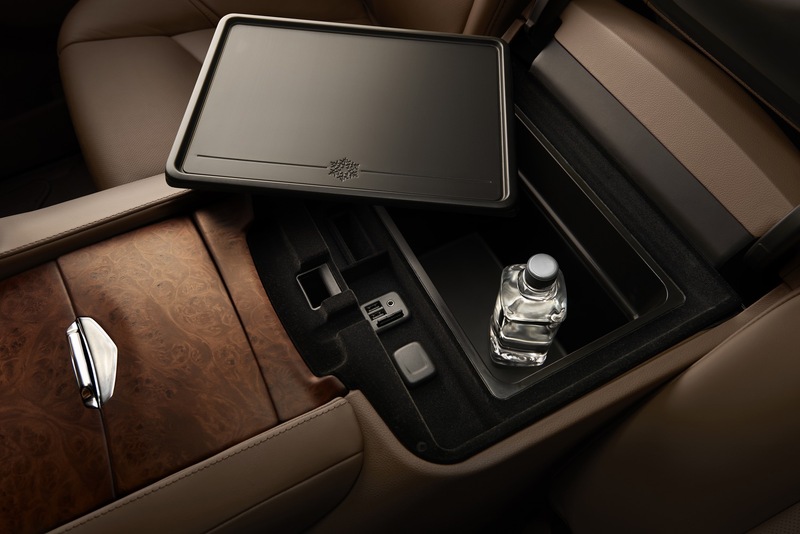 Even on the inside, the Navigator is using an dash ‘inspired’ by the 1961 Continental. 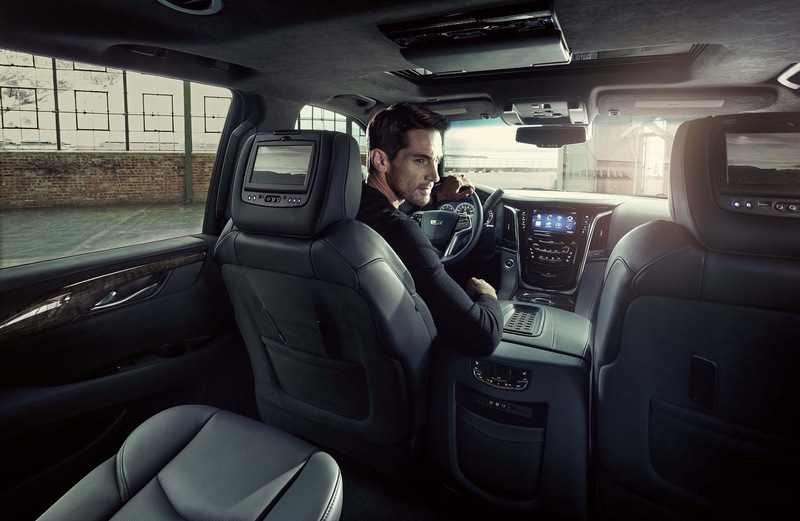 If there was any more proof that Ford was out of good ideas and was unwilling to make something for THIS century, then my comment about American luxury automakers stands. 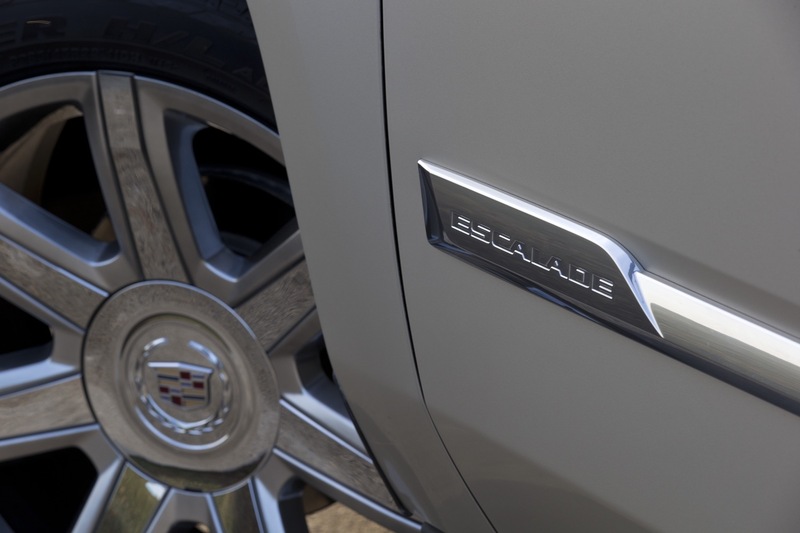 It’s just Cadillac and Tesla now. 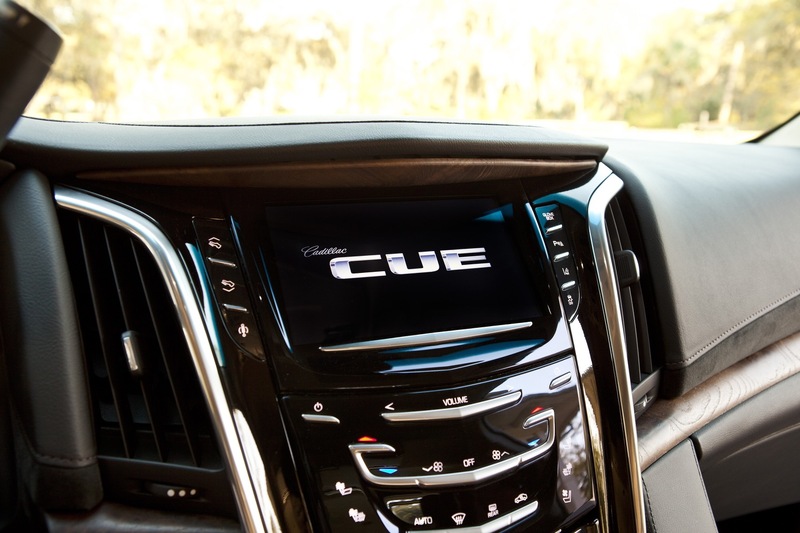 I’m curious to see exactly how much of an improvement the CUE system really boasts. 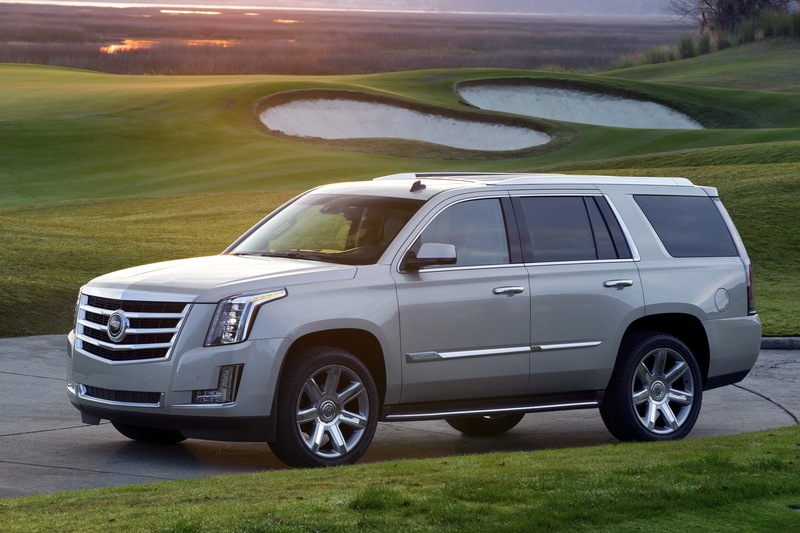 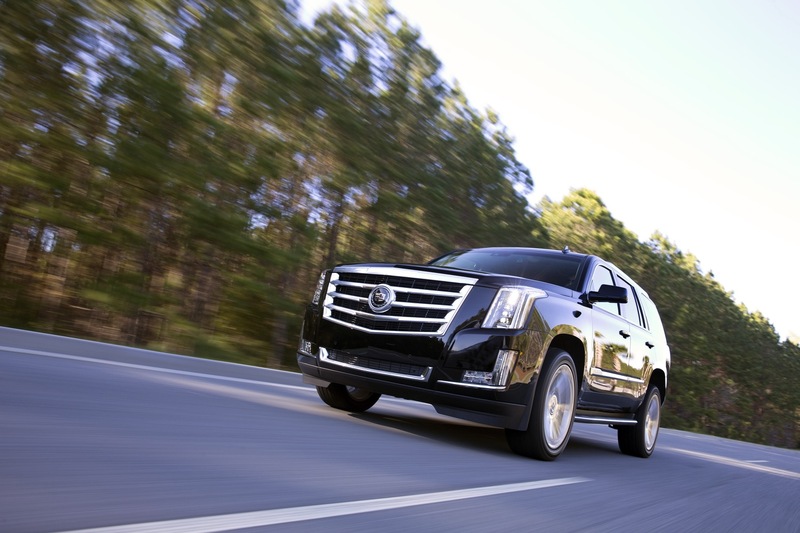 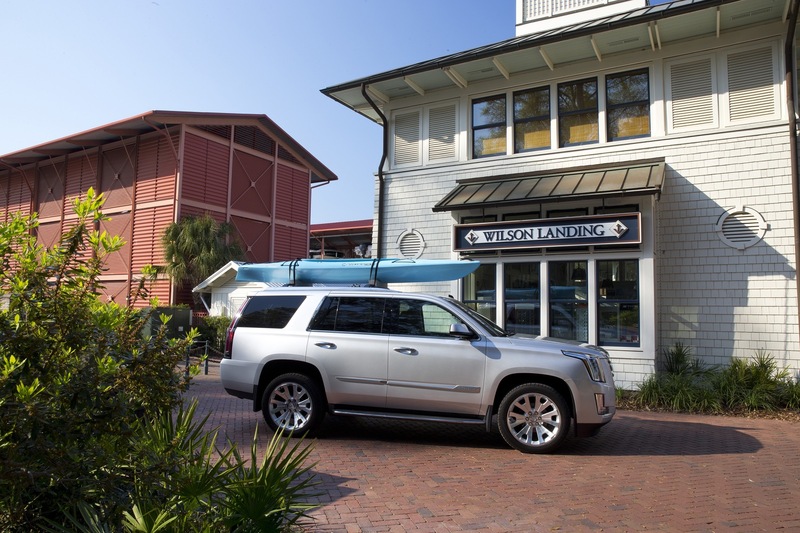 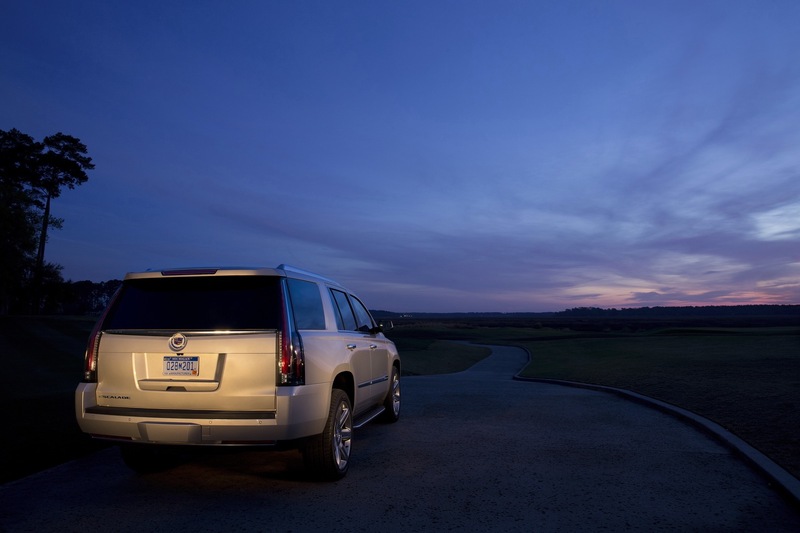 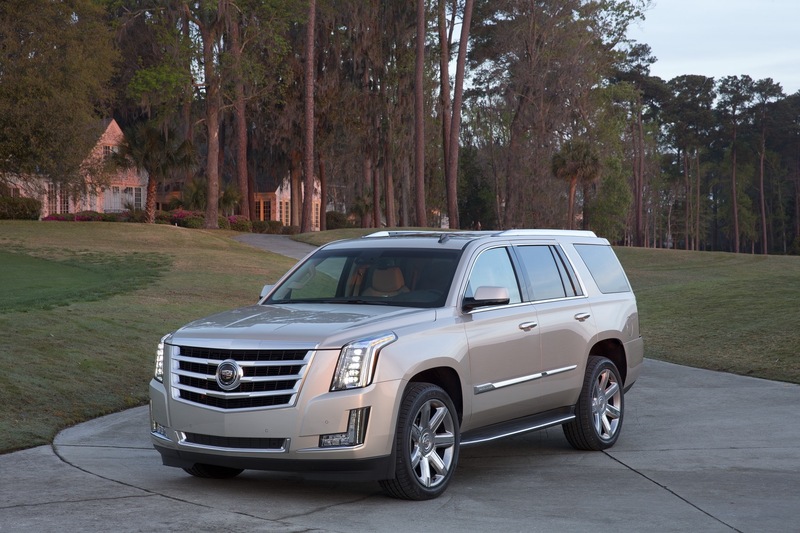 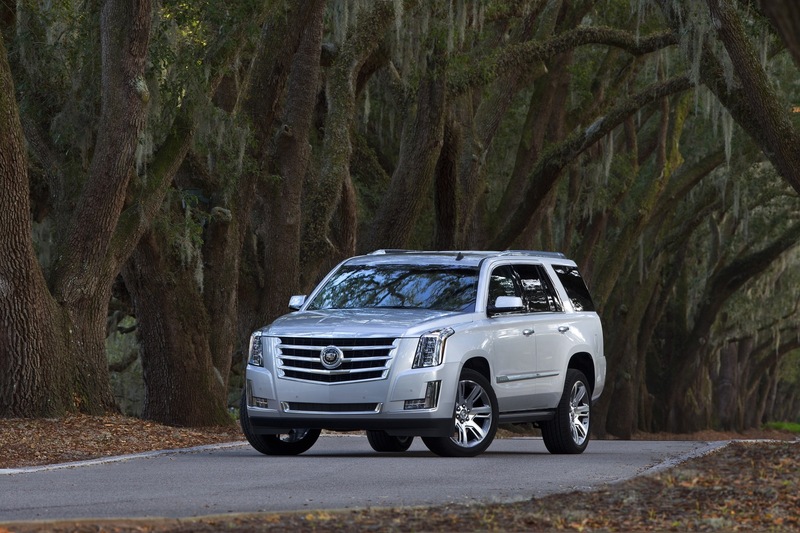 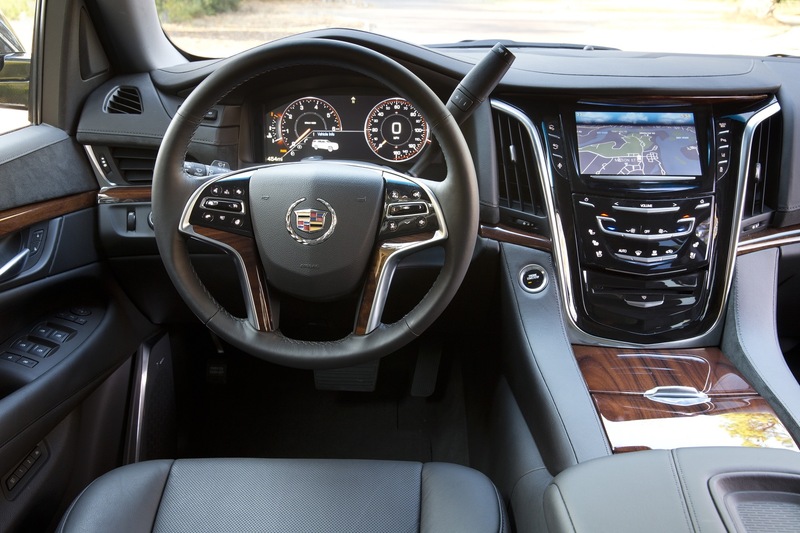 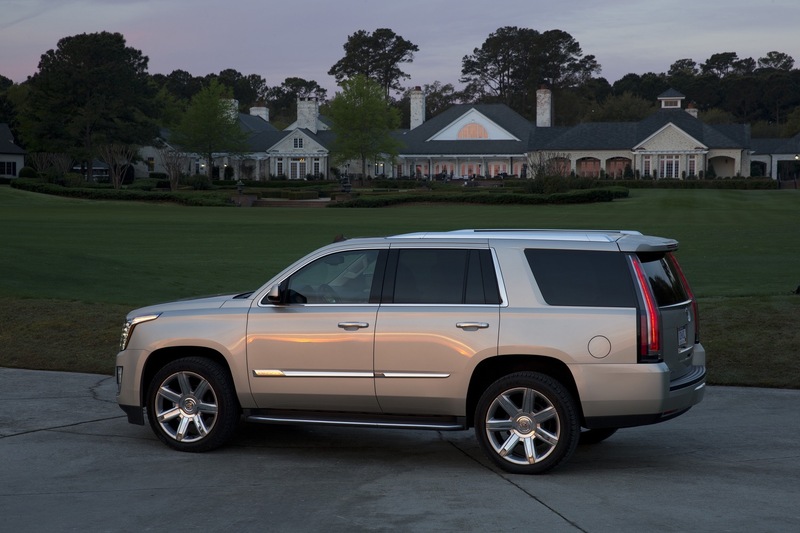 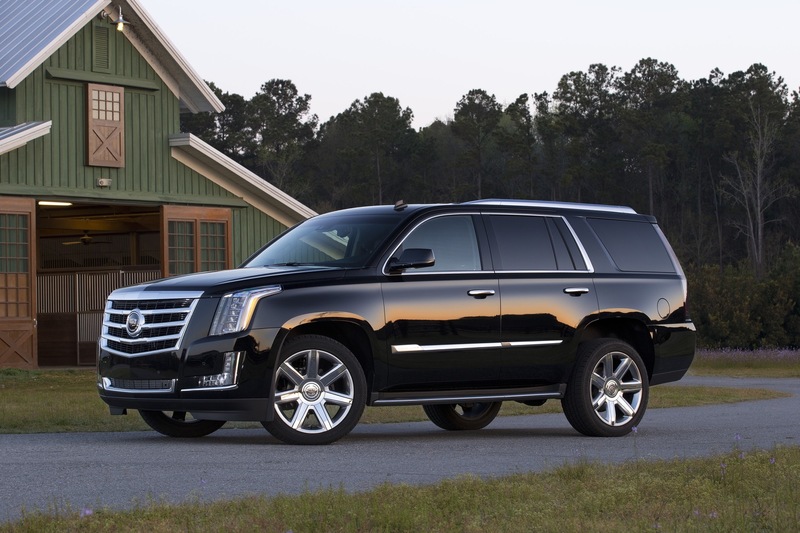 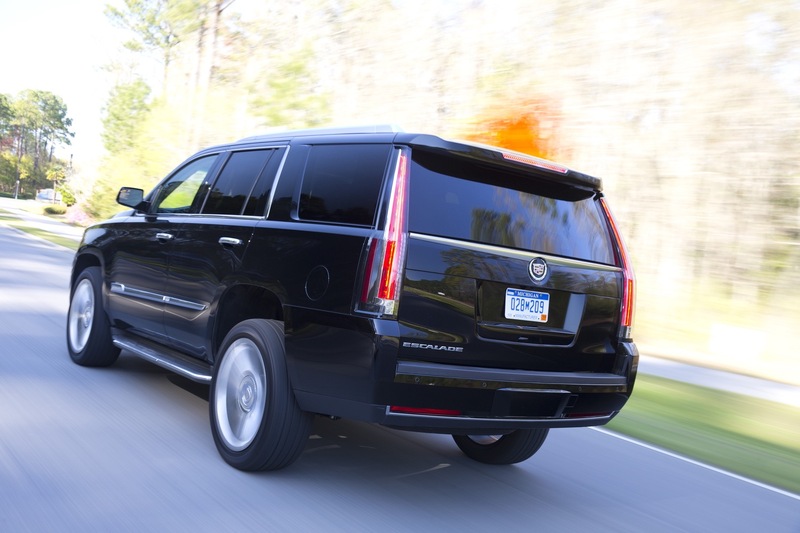 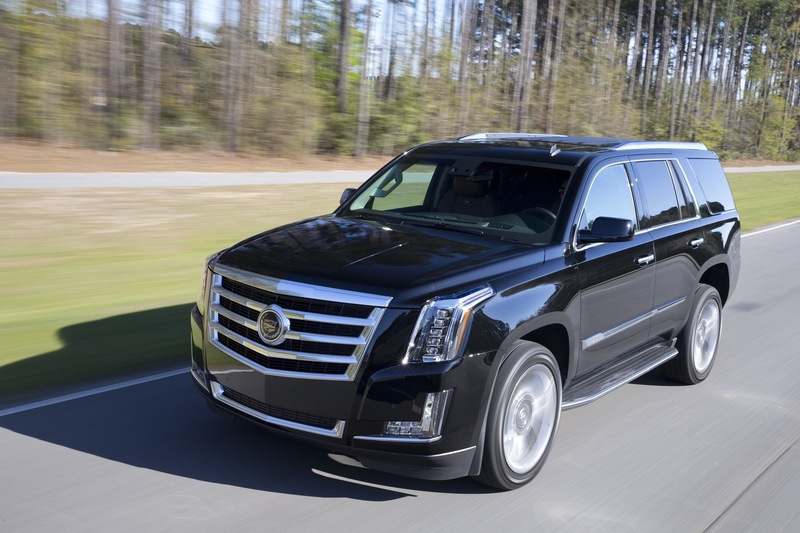 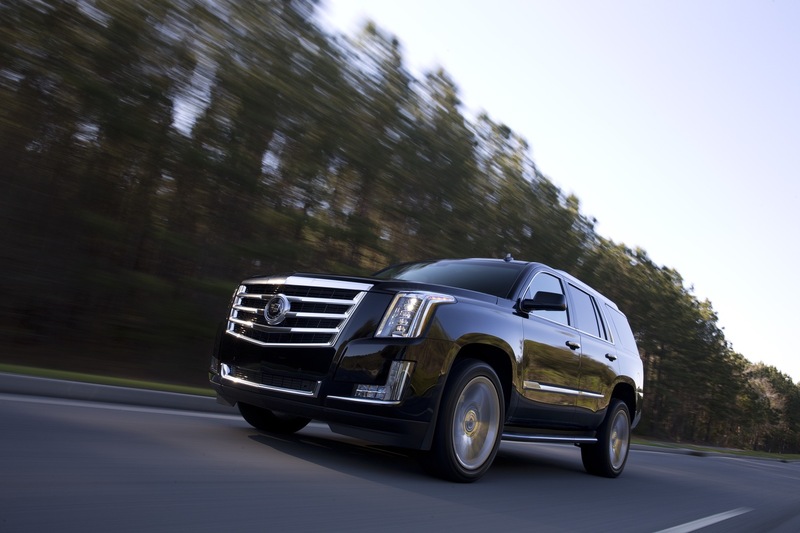 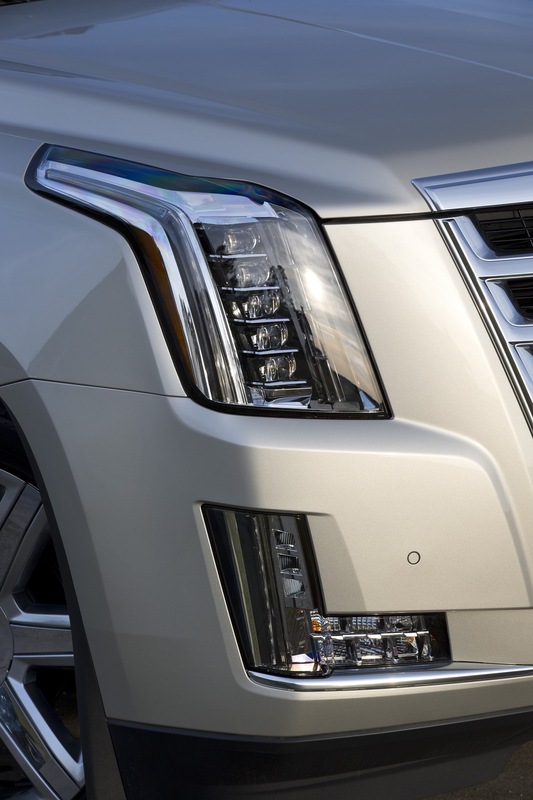 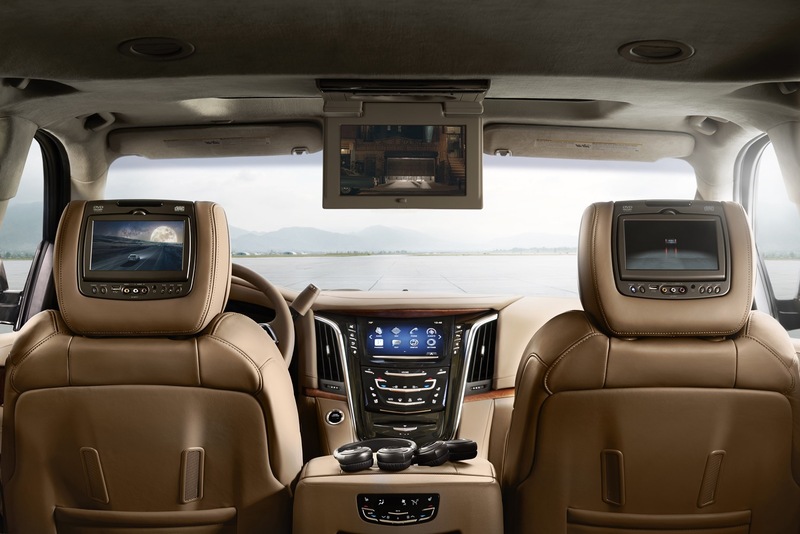 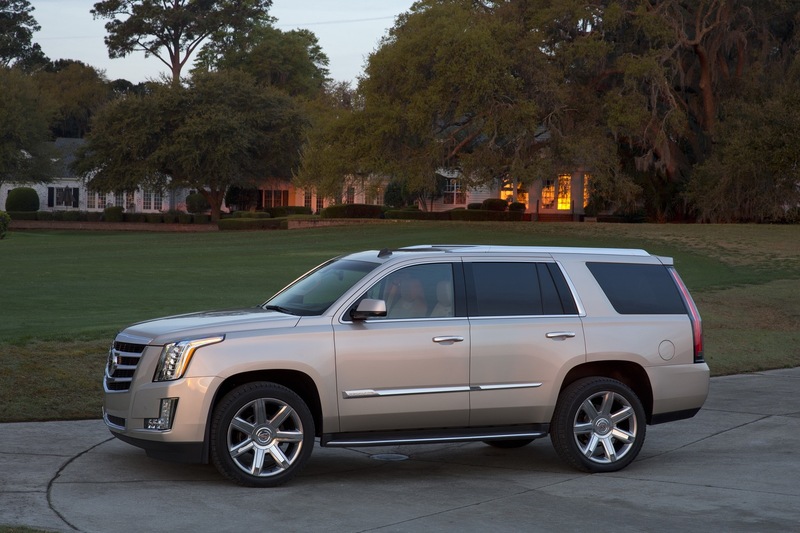 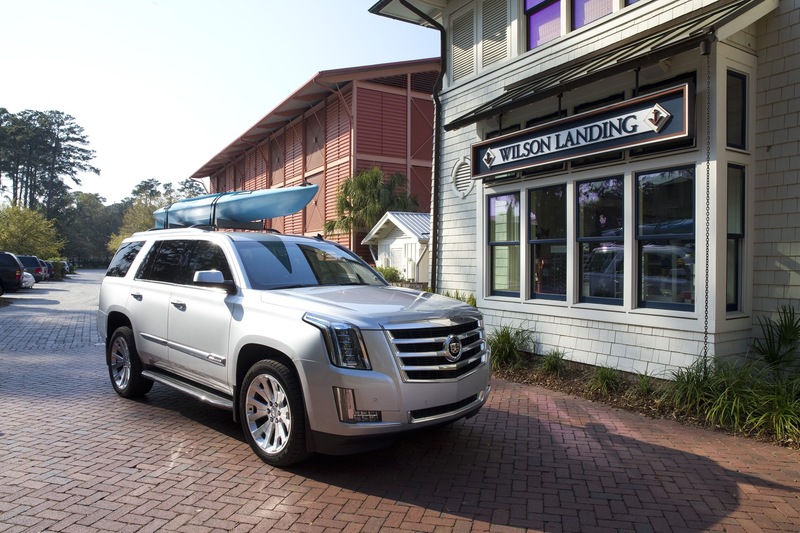 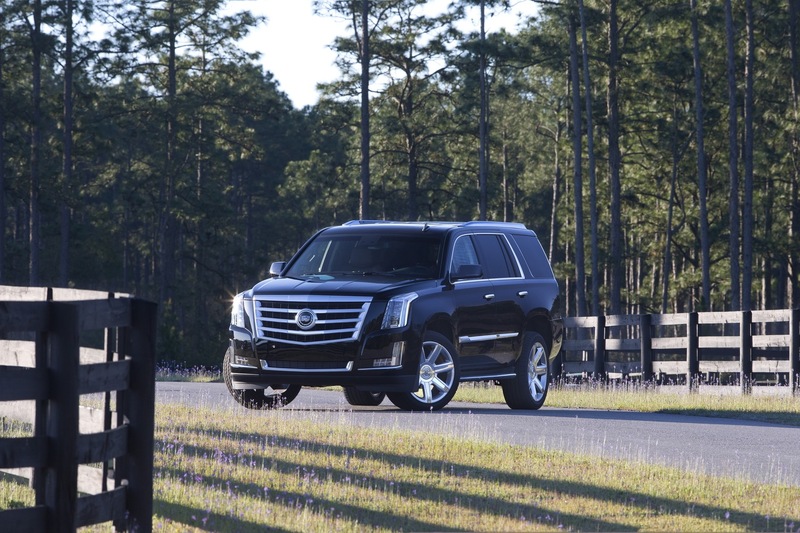 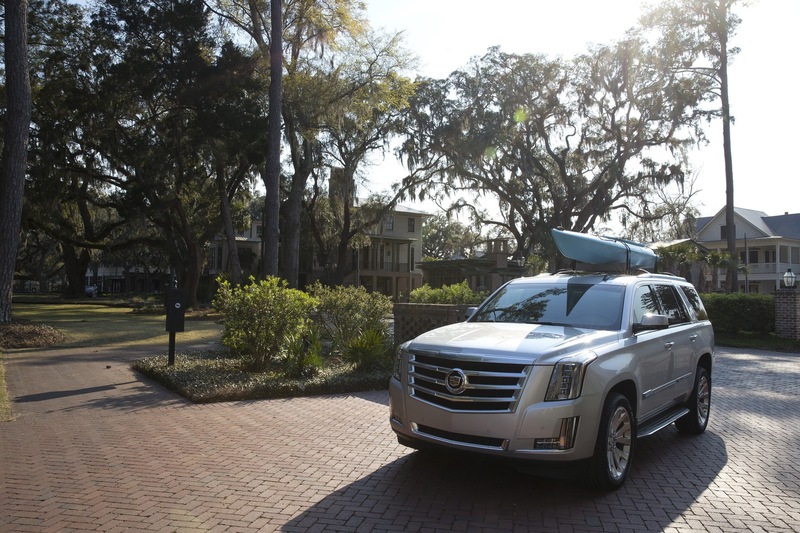 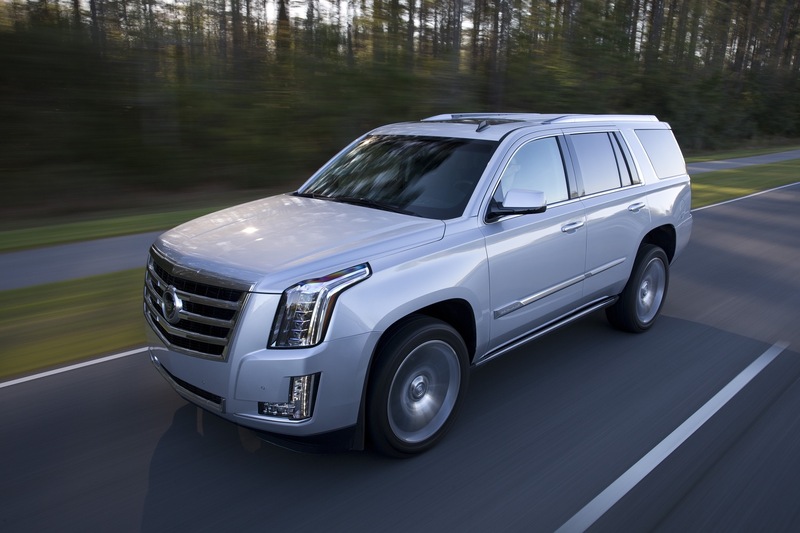 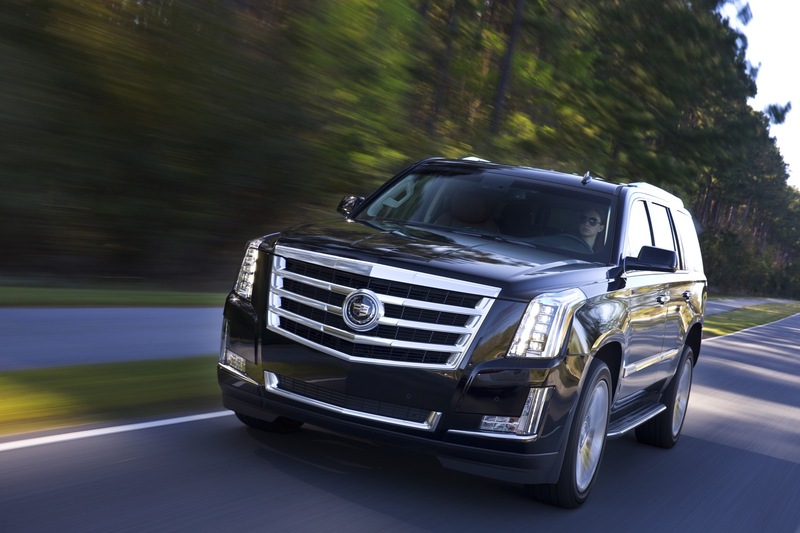 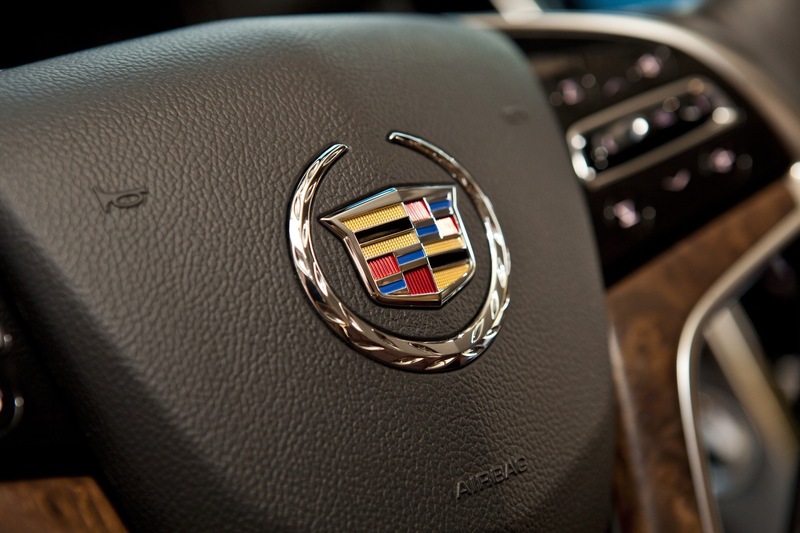 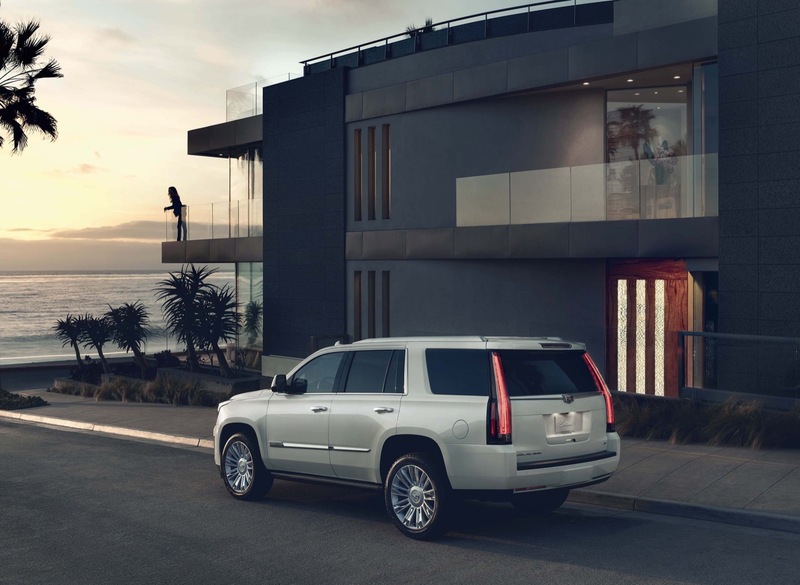 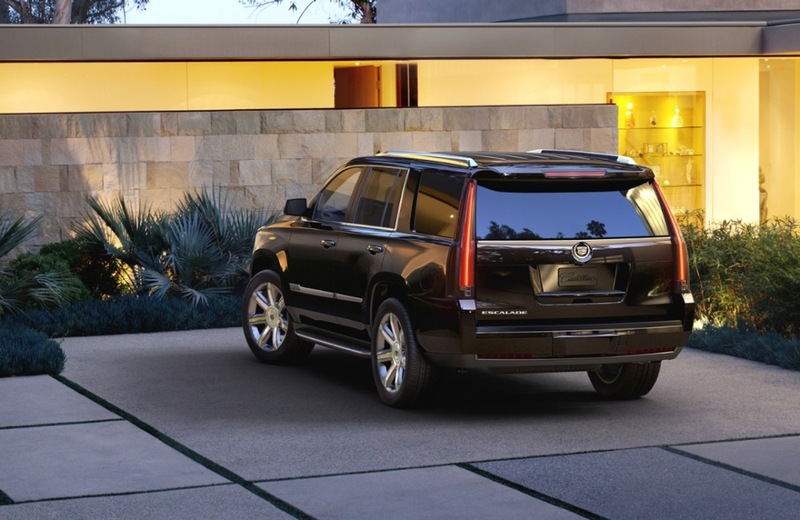 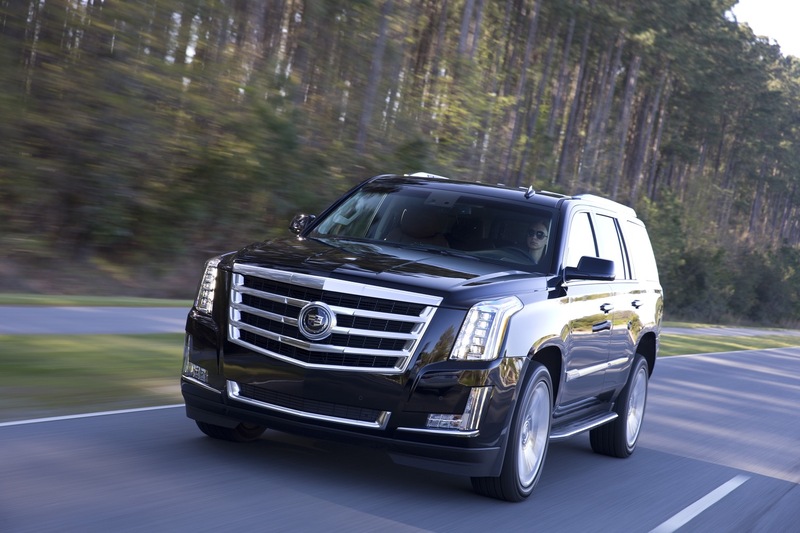 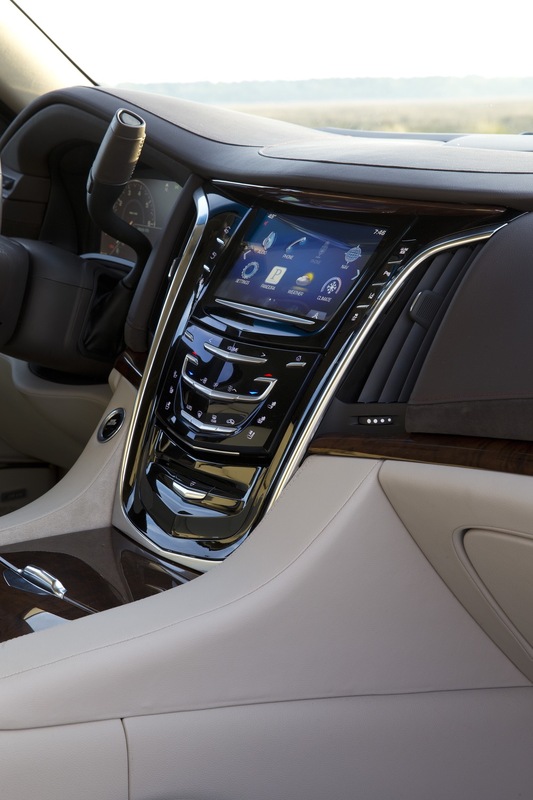 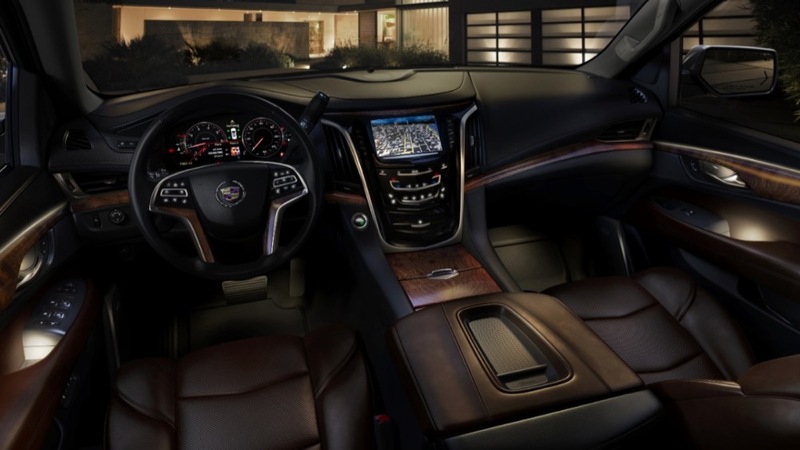 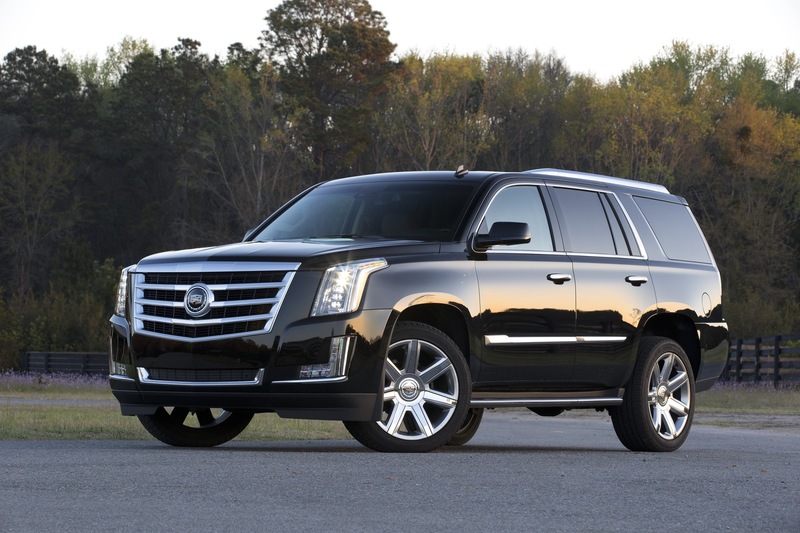 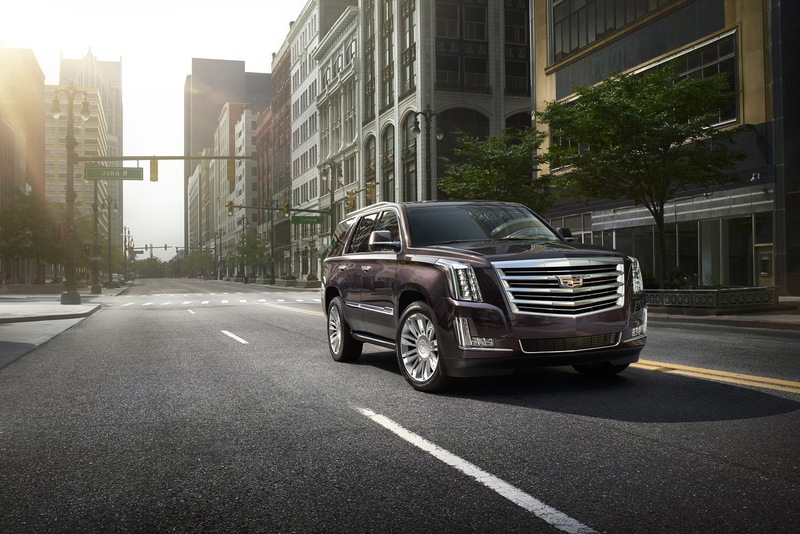 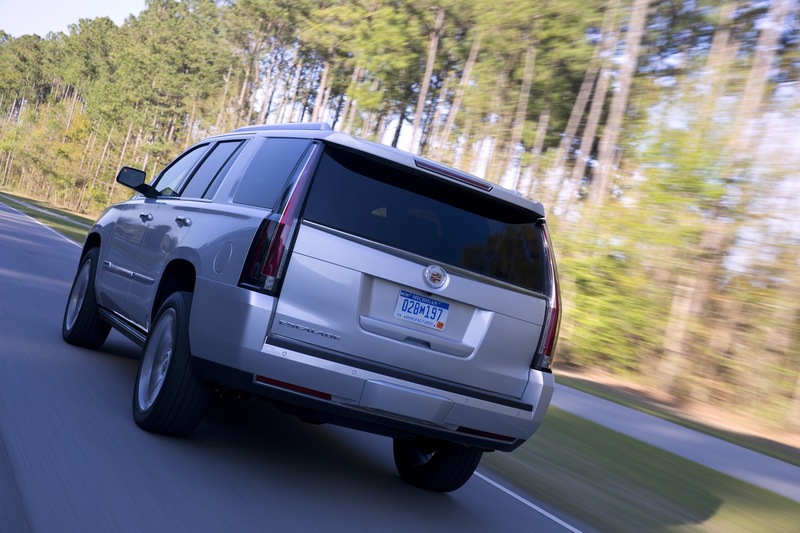 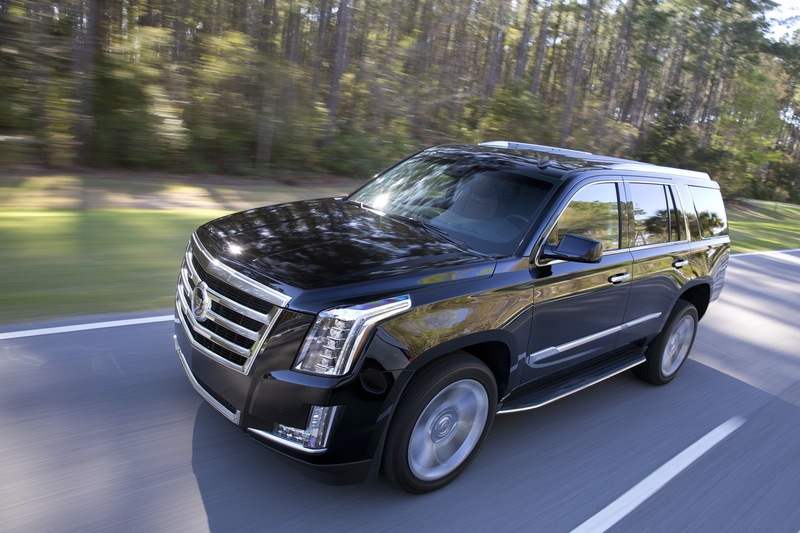 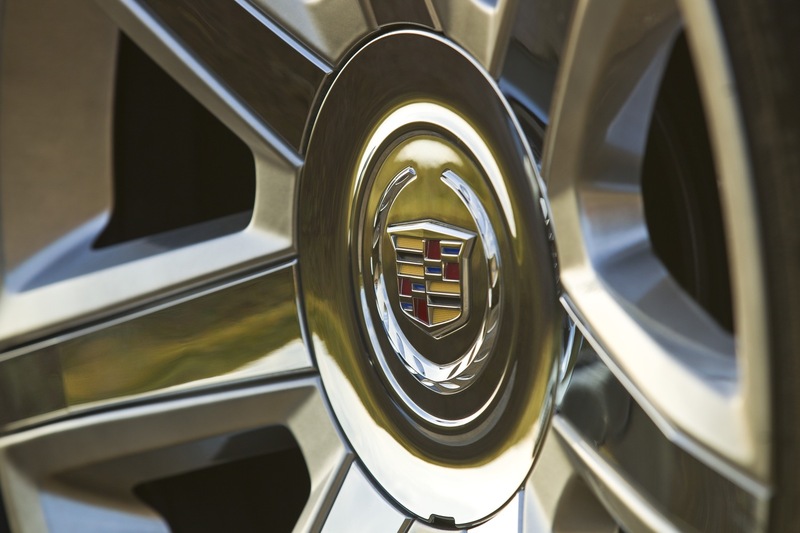 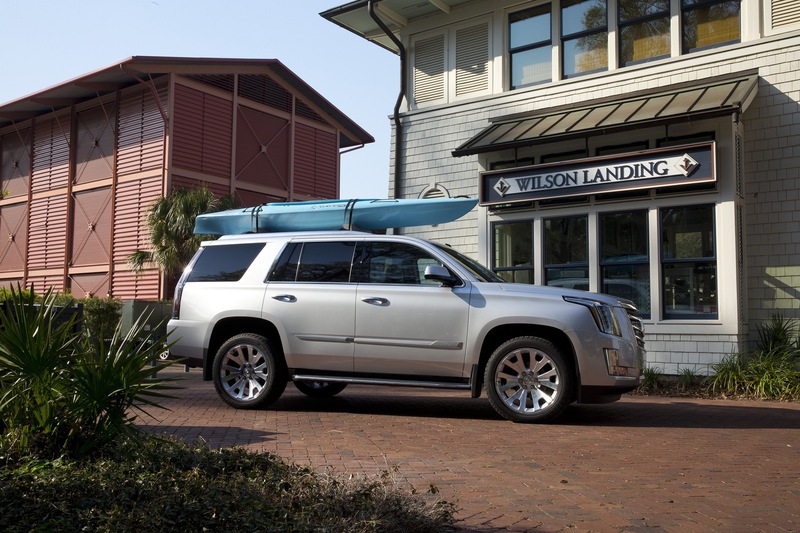 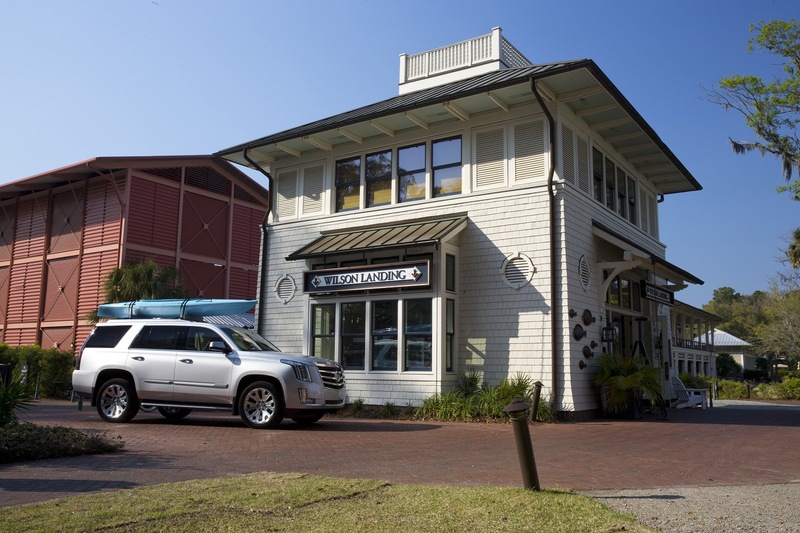 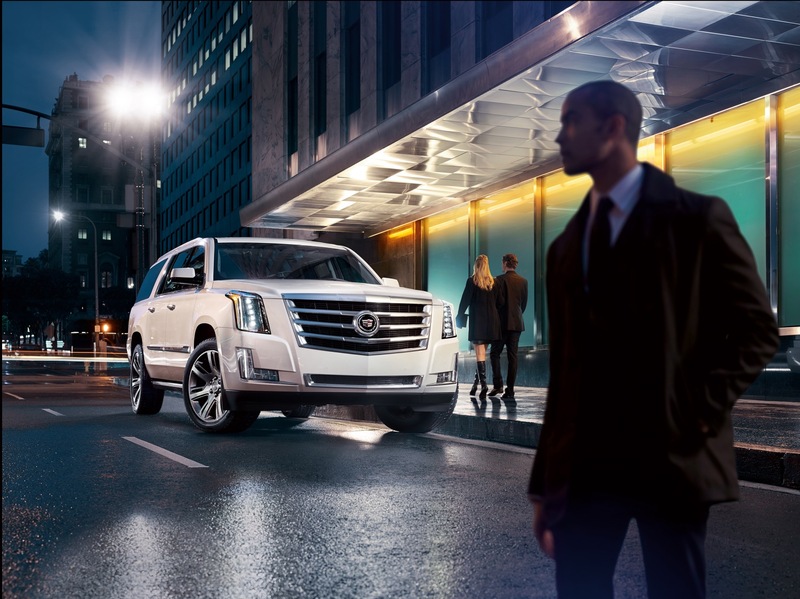 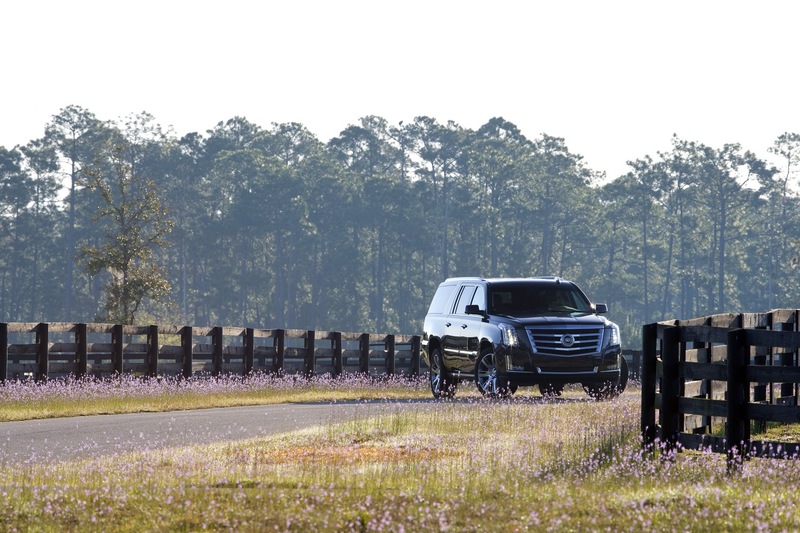 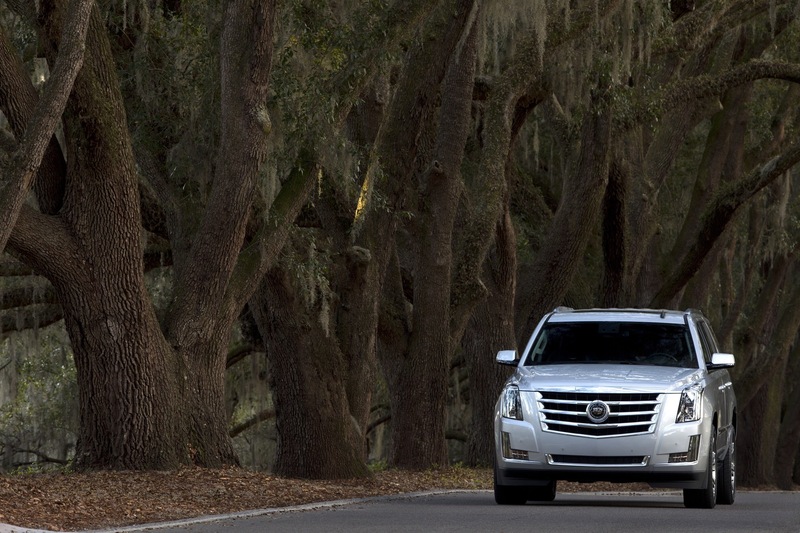 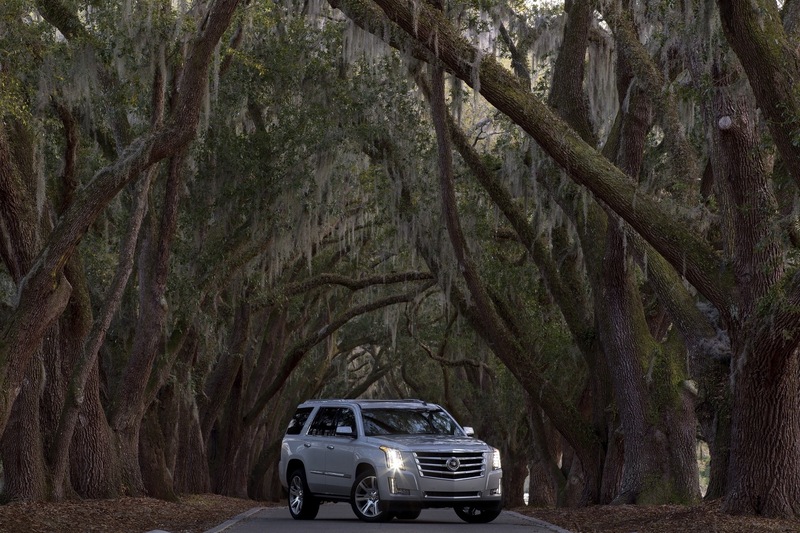 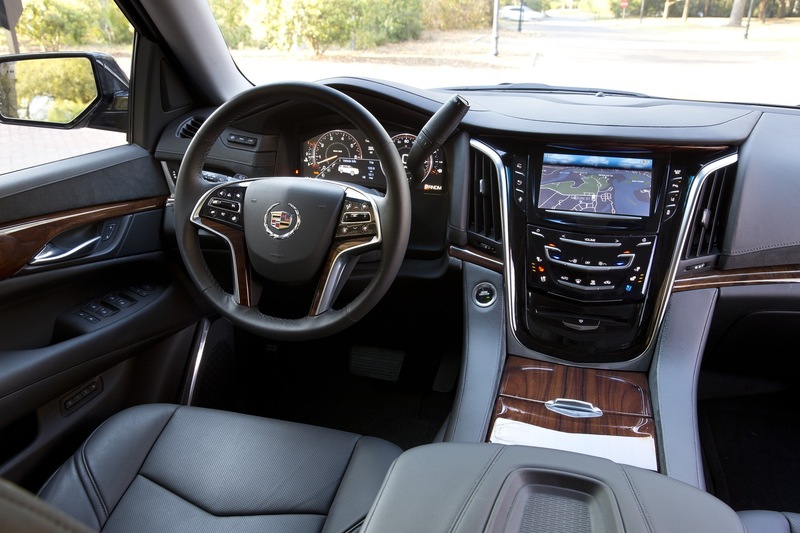 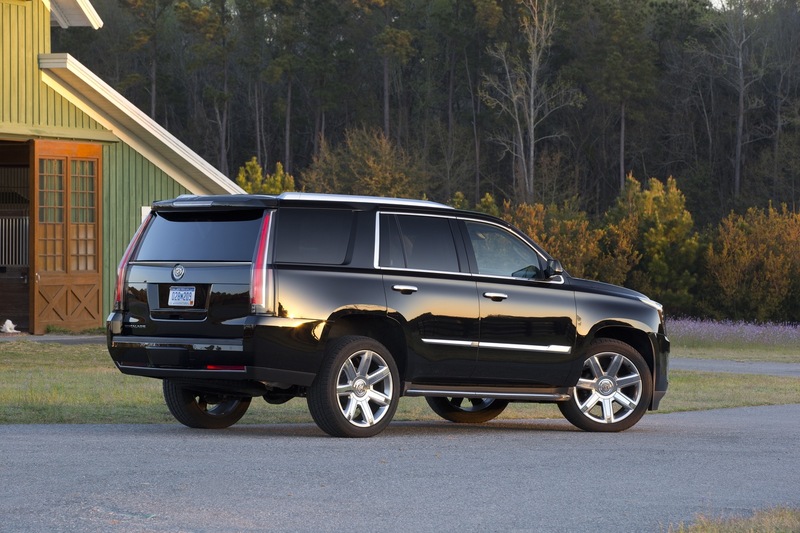 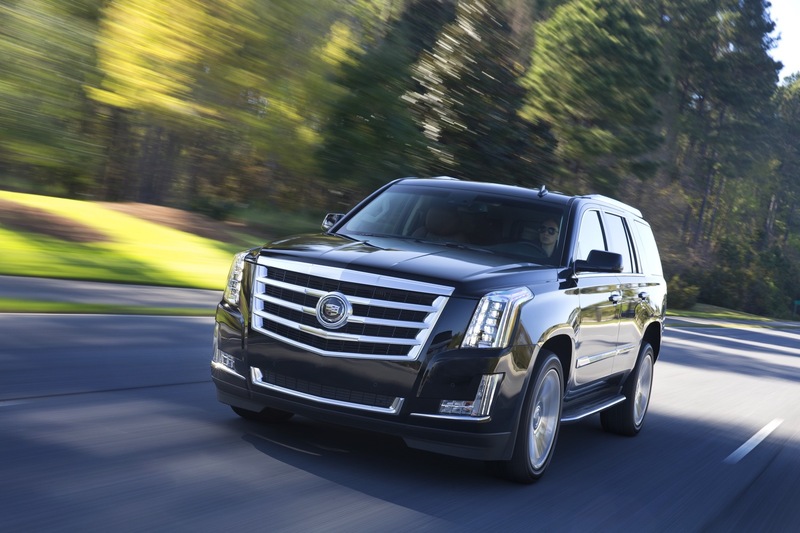 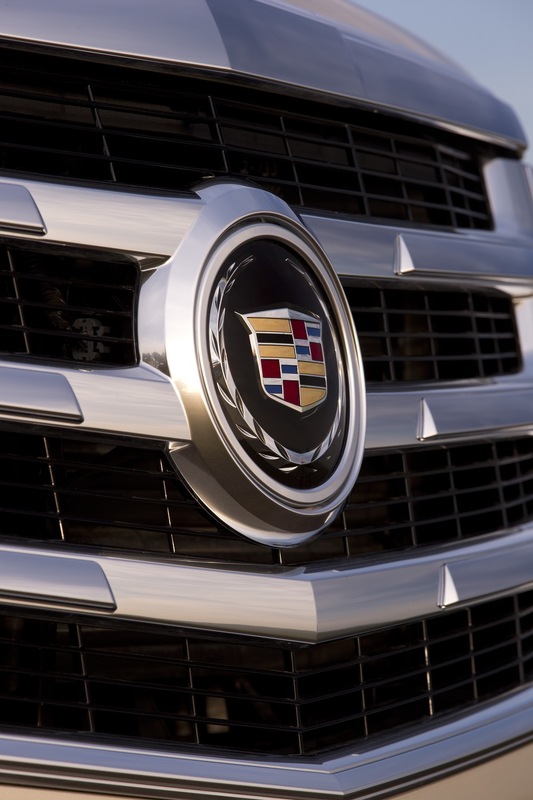 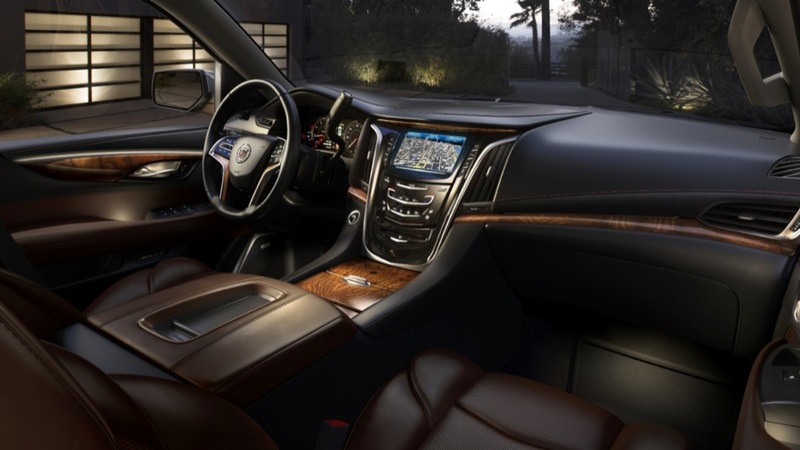 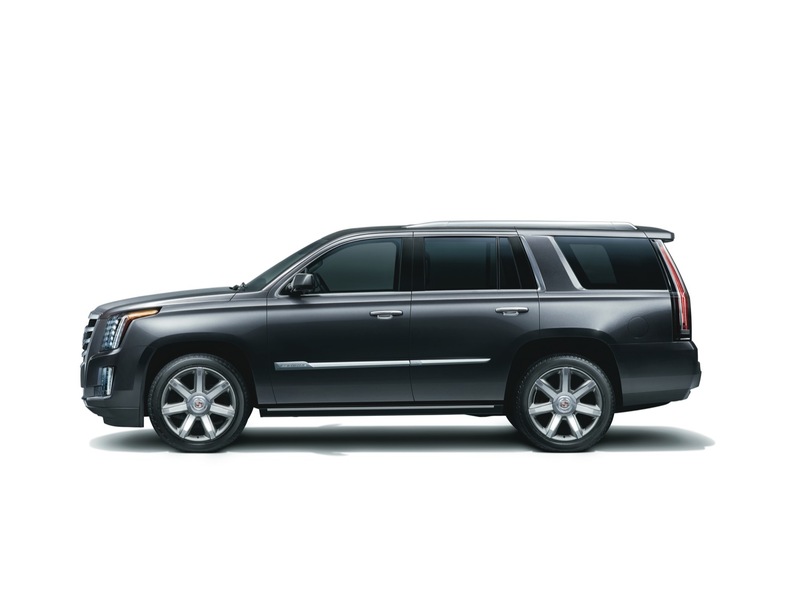 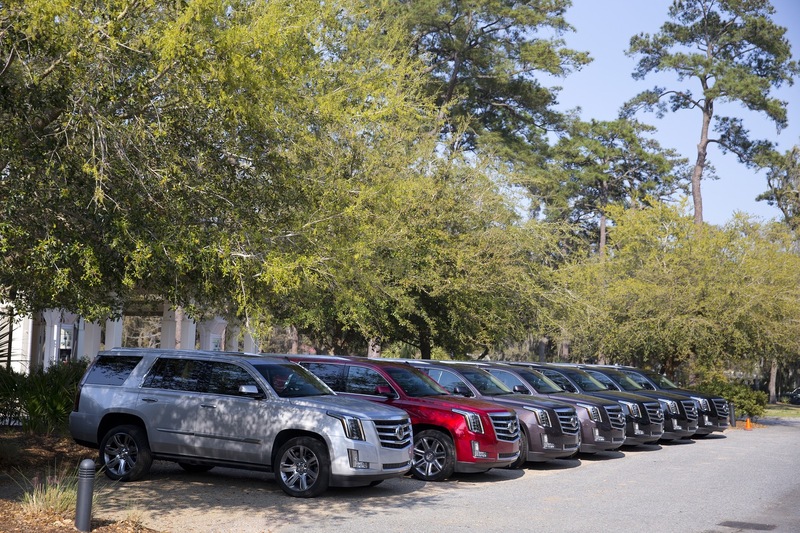 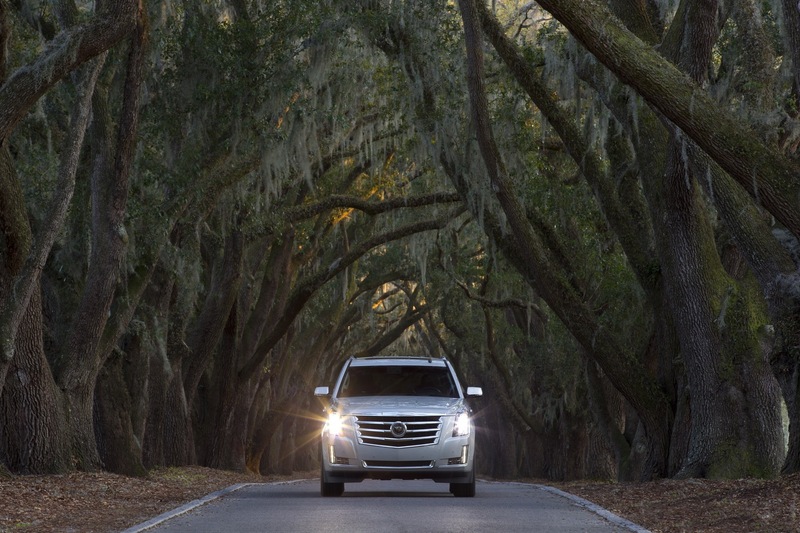 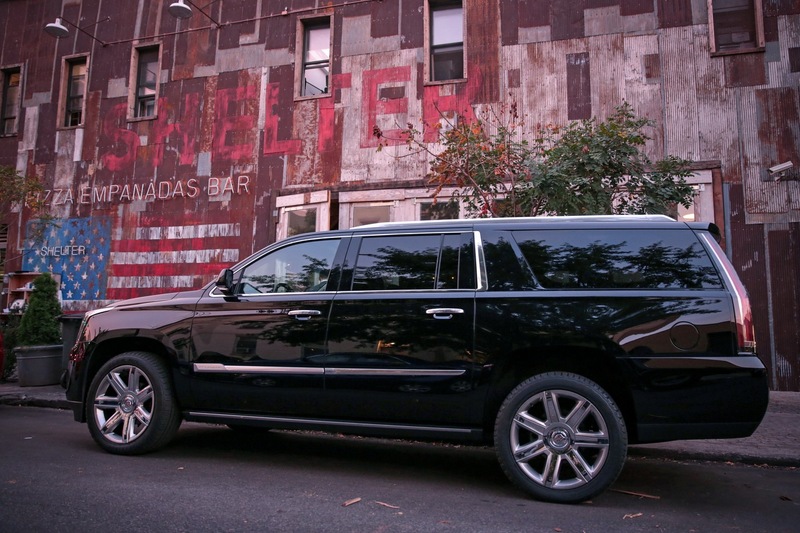 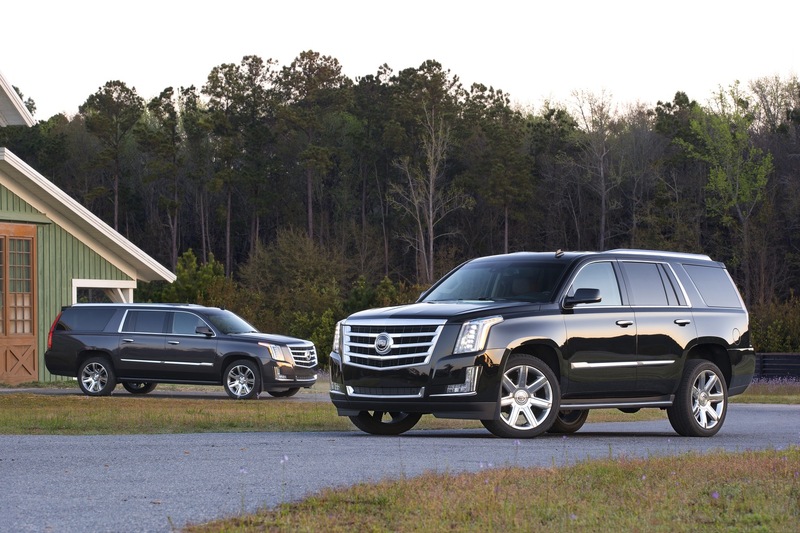 A strong and responsive infotainment system will do the Escalade some much needed favor. 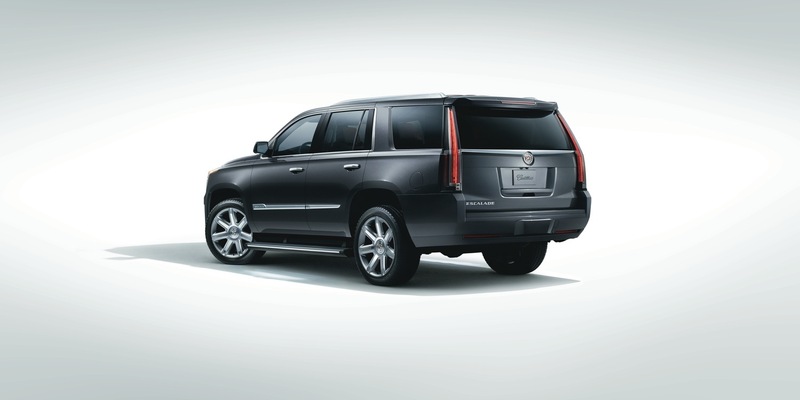 Other than that this looks to be one solid SUV! 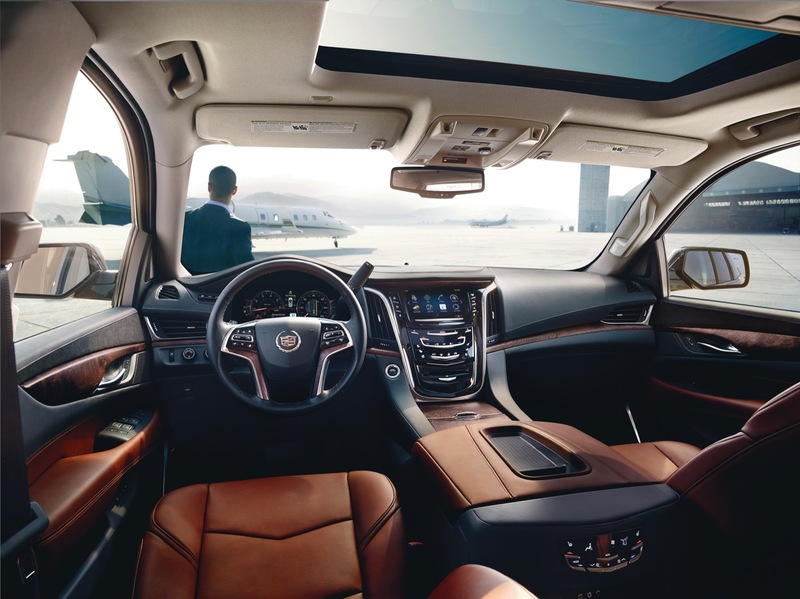 For those who love luxury… It’s a beauty, inside and out. 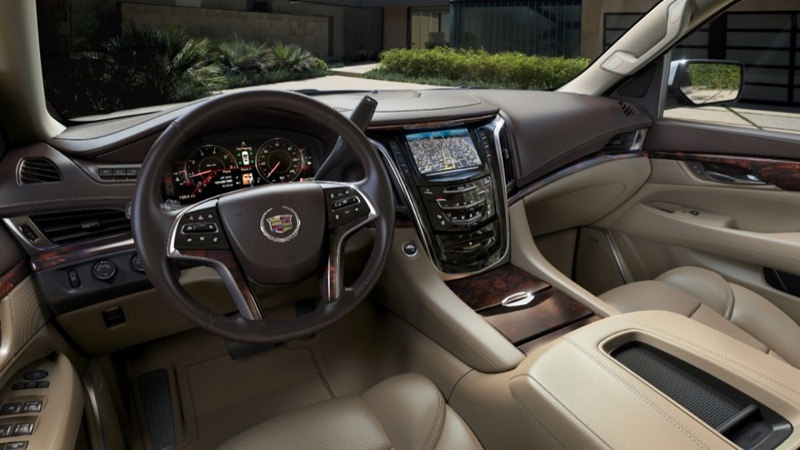 I really love the new cadillac interior style! 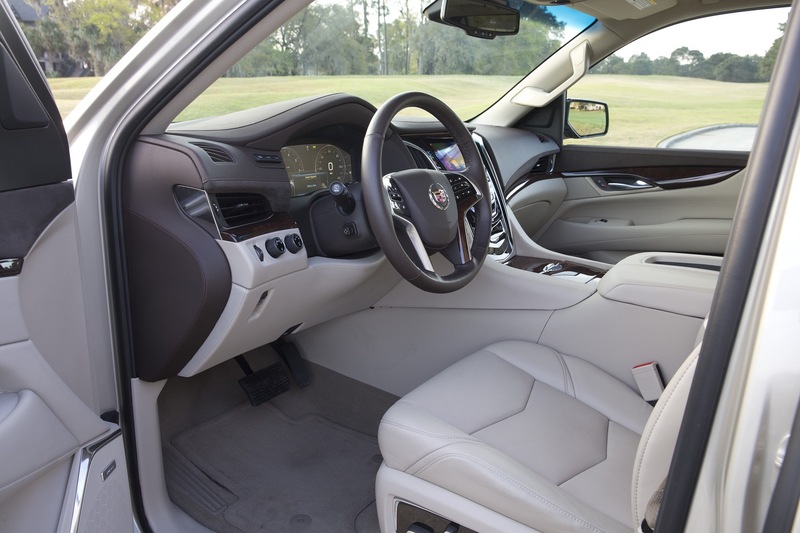 Not bad but with all this effort put in and in its fourth generation now would it have been too much effort to replace the granny shifter with something more elegant? 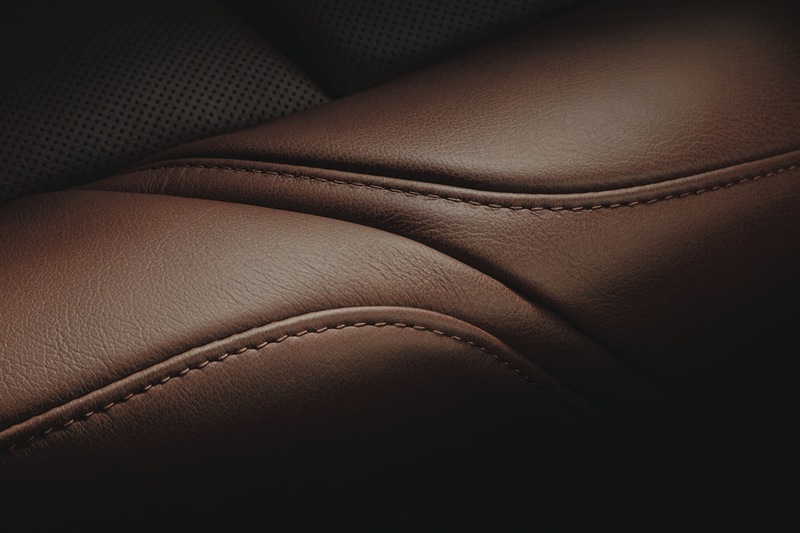 Some PRND buttons running down the side of the centre console would look swish. 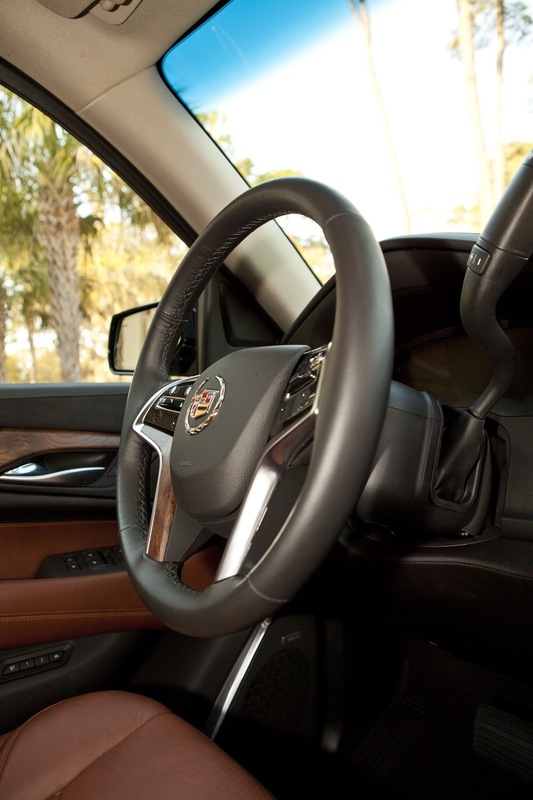 Starter button would just need to be relocated higher on the dash somewhere.